Finally! Its a real Episode! All done! Finished! 100%! 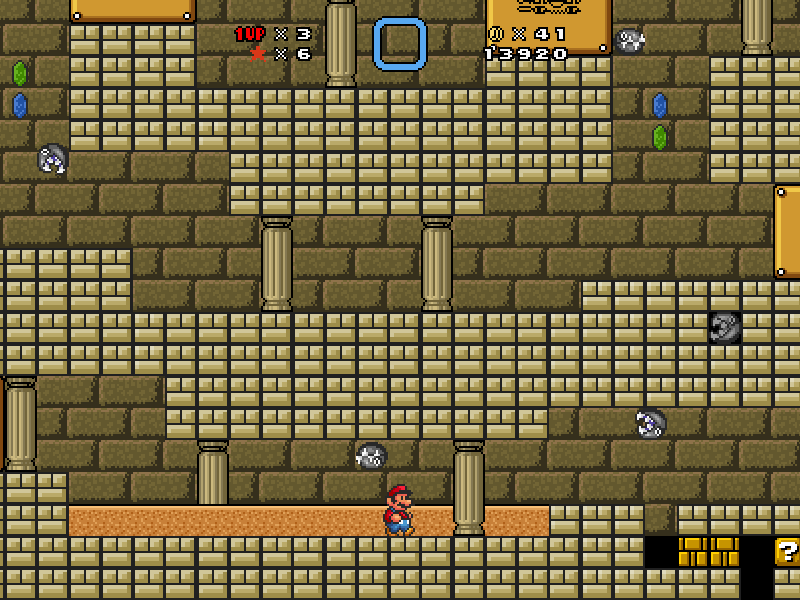 In this episode, there are 7 Temples the player (Mario) must complete. Why you ask? 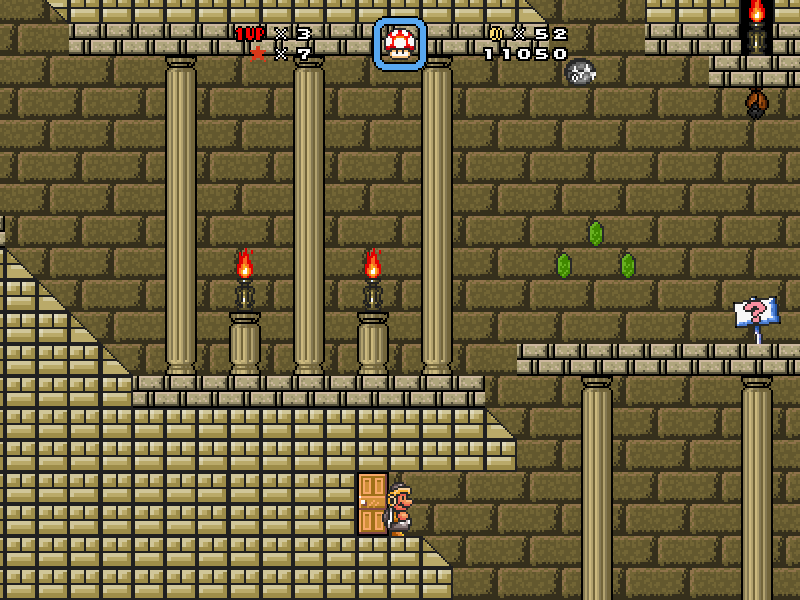 Mario is called to the castle because of a most threatening emergency. Princess Peach, who isn't captured, explains the situation. Peach: "Mario, 16 Star Kids were going to make their trek from Star Born Valley to Star Haven. Only two of them ever made it, and one of those two disappeared shortly after. The land went on high alert, searching high and low for the Star Kids. Now activity has been noticed in 6 abandoned temples. I think these two events are related. It sounds like Bowser has made a move. Please, you must save those poor Star Kids!" If you cant tell from the title, its based around Zelda, and more specifically, Zelda Temples. I wouldn't go as far to say they're all unique and stuff you've never seen before, but they arent all just-hit-the-colored-switches-to-win kind of things. (Even though that's exactly what the Sky Temple is) I think they're a bit more puzzling than that. The difficulty isn't adjusted for anything in particular, and I personally think they're all pretty difficult. 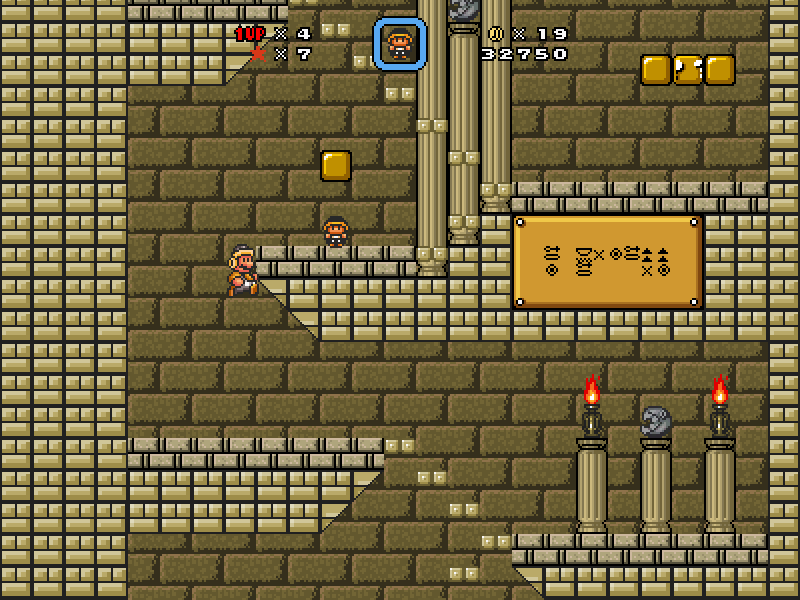 The episode has the player play the first 6 temples in which ever order they wish, and then the Temple of Time. So if you thought the Shadow/Sky/Earth Temple would be substantially more difficult than the Grass/Water/Fire ones, you may be in for a surprise. And with that, a download link for you to see for yourself! http://www.mediafire.com/download/qqhqb ... _Peach.rar - NEW! Shadow Temple Boss Music starts too early, and one small section doesnt have music. tl;dr - Top notch episode, go play it now. Last edited by Yogi_Bear on Thu Aug 11, 2016 11:43 am, edited 30 times in total. Which boss? Maybe I can make it. Last edited by Core on Tue Dec 30, 2014 12:28 pm, edited 1 time in total. If you would like, I can make a Hub level for you. Locked since this has no screens. PM me or another Level Judge with screens to get this unlocked. As for the hub: I was going to work more on the hub after I got all 7 levels done the way I wanted, but if you want, PM me and I can tell you what I had in mind, or you could just make a crude/temporary hub for me so this is a legit "Episode"
Last edited by Yogi_Bear on Tue Jan 20, 2015 4:51 pm, edited 1 time in total. Yogi_Bear wrote: I'm missing some SMBX files so I cant play the invasion 2, I can only use the level editor. So yeah. That's weird. Have you tried reinstalling SMBX? That's the only thing I can think of that should fix that. First of all, I'd like to question the title: why is it "The Legend of Peach" if Peach isn't a central character? I know that this is inspired by Ocarina of Time and that Peach and Zelda are both princesses, but Zelda was always more than just a damsel in distress; even going back to the first Legend of Zelda for the NES, she was the one who broke the Triforce of Wisdom into eight pieces to prevent Ganon from getting it. With that said, what does Peach have to do with this "episode"? It's not like she's who you have to play as since the screenshots (and even the in-game dialogue) indicate that you have to play as Mario. Plus, nowhere in the level pack is it indicated that Peach is significant to the plot of the "episode" at all. Also, the zelda-item sound replacement provided is pointless since it's almost exactly the same as the one that comes with SMBX. You should remove the "ing" from this dialogue. Also, since the pronoun "them" (plural) is referring to "evil" (singular), you should type "it" instead of "them." This screen was quite confusing. Hitting the switch triggers a shell generator to appear, but the event that shows the generator triggers another event that hides it. When I first hit the switch, the generator was hidden before it generated a shell, and since there's no return warp by this door until after the Piranha Plant is killed, I thought I was stuck at first. You should delete the event that hides the generator (if you want to, you can increase the delay for the shells by a second or two). Here's the only instance of cutoff I found in the entire level pack. 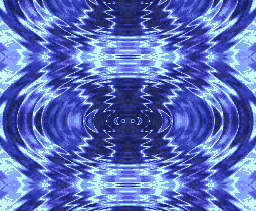 If you have background images overlap the same area, the one furthest to the left will appear in front. It's unintuitive that this NPC can't be stomped on. I know you think that it's needed to throw the spring up onto the ceiling, but it's not (running also causes the player to jump higher). 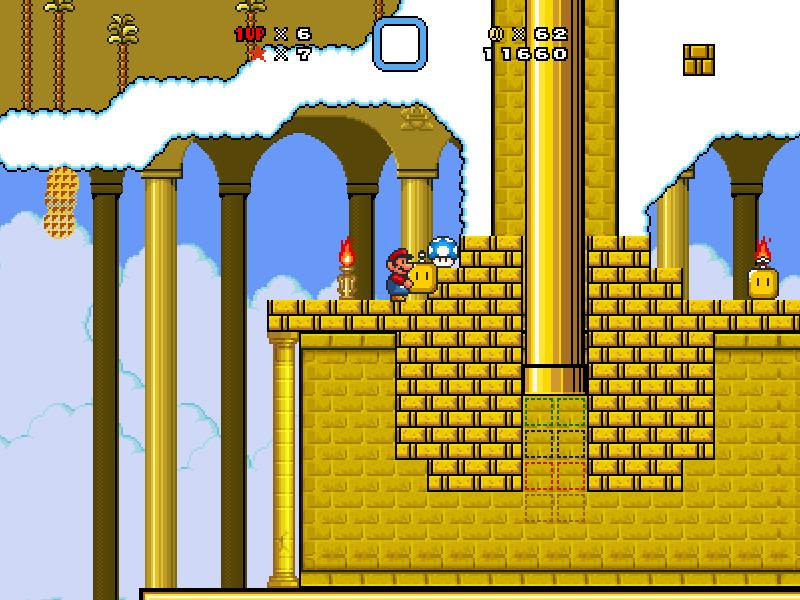 Plus, first time players won't realize that there are platforms up there since they're so high up and blend in with the surroundings; I recommend making the NPC stomp-able and lowering the ceiling by two units (and, just for good measure, add a rupee trail going up from the vine with one above the ceiling). 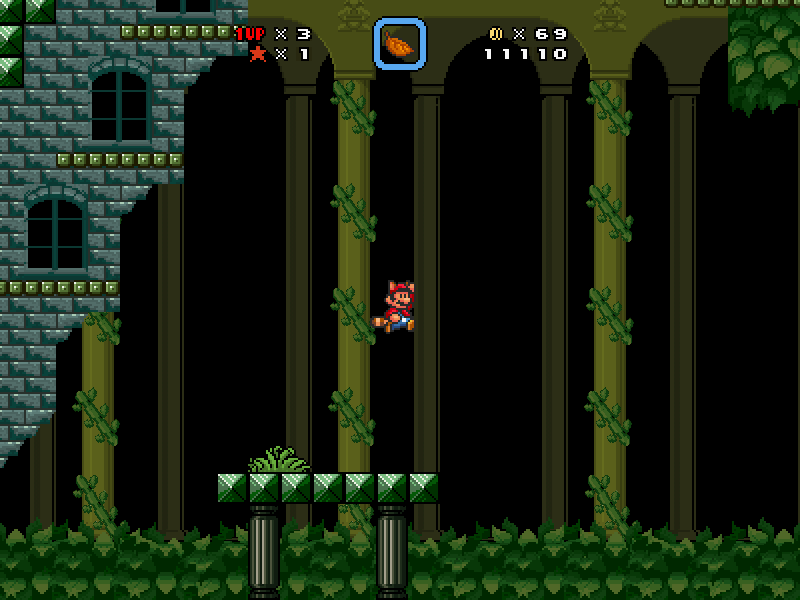 By the way, I know that you intend for the player to kick the shell through the small openings, but it's also possible to simply throw the shell straight up, climb the vine, then jump off and grab the shell in midair and continue that way. 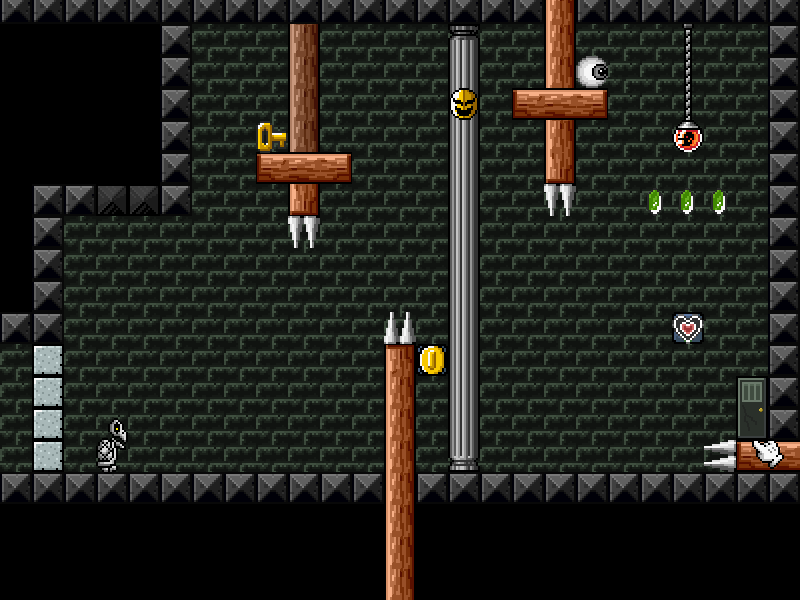 This part is very cruel, especially for what is supposed to be the first level. 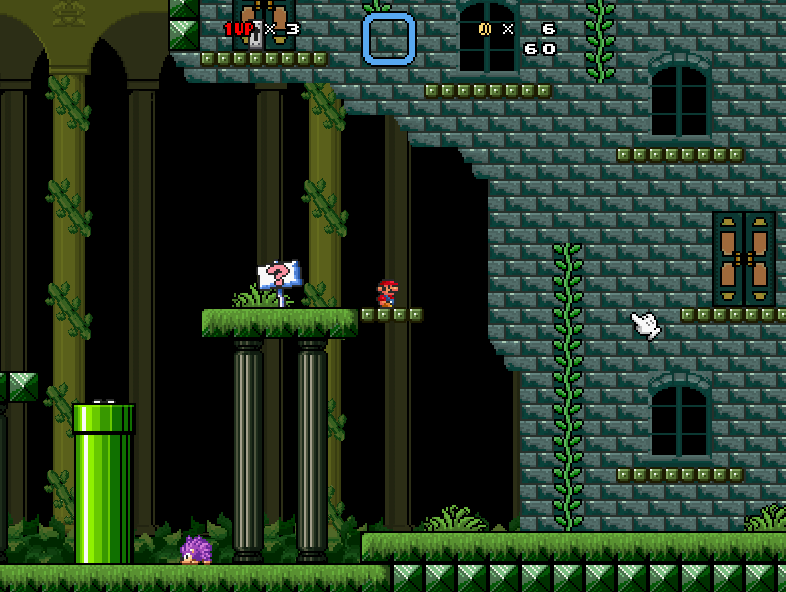 For starters, there's barely enough platform-space for the player to get enough speed to fly. 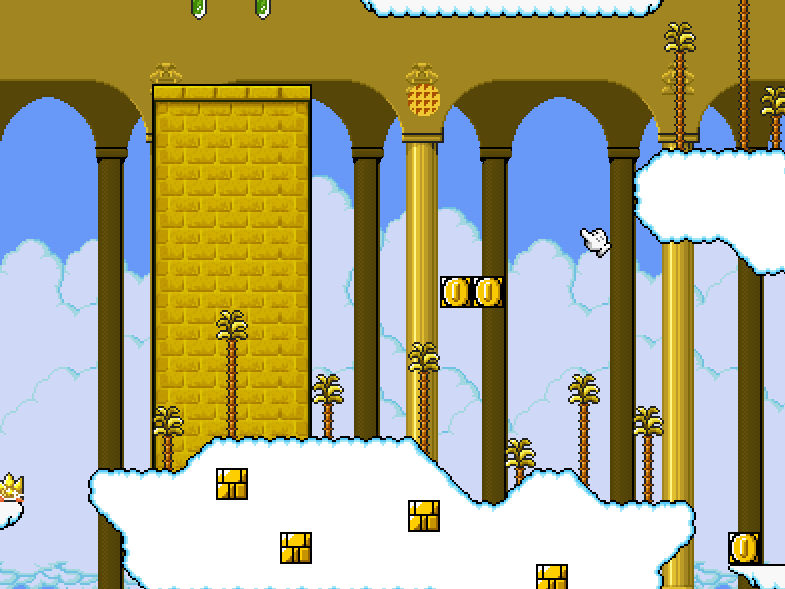 Second, the player has to jump across three separate platforms in order to get enough running speed, and since jumping prevents the player from being able to build up flight momentum, this means the player needs to jump just the right amount so that he/she lands on the left edge of the platforms. Third, one of the platforms is slippery (why is the moss slippery, anyway? 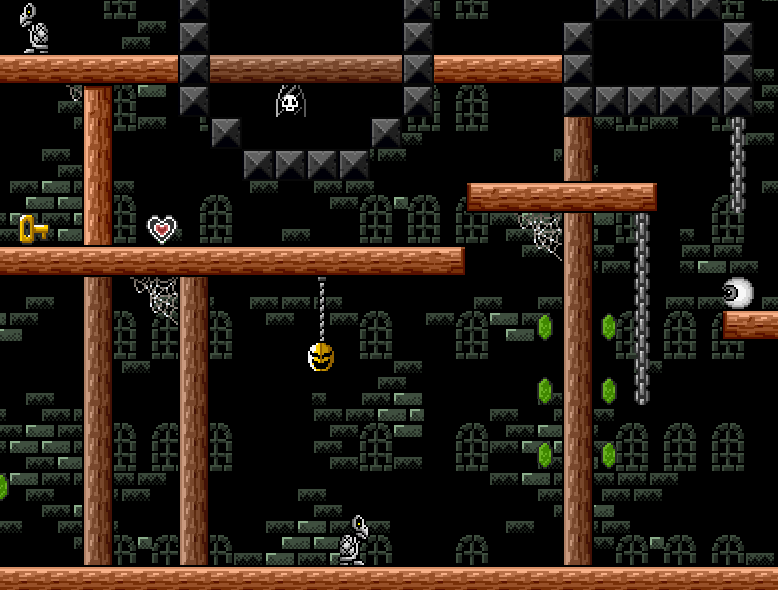 It doesn't make the level any more challenging, just more annoying), which just adds to the amount of blocks the player has to run across to get flight ability. 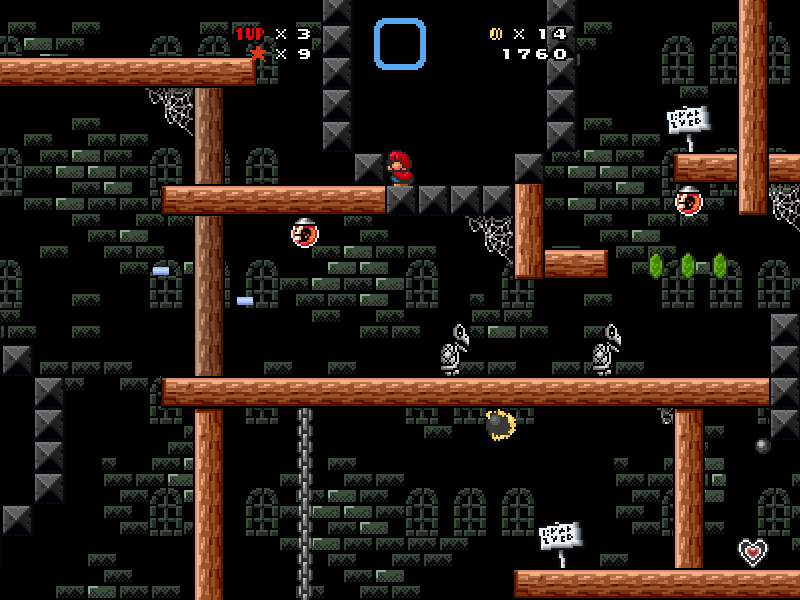 Fourth, that's a bottomless pit; a single mistake causes the player to die and have to start the entire level all over again. 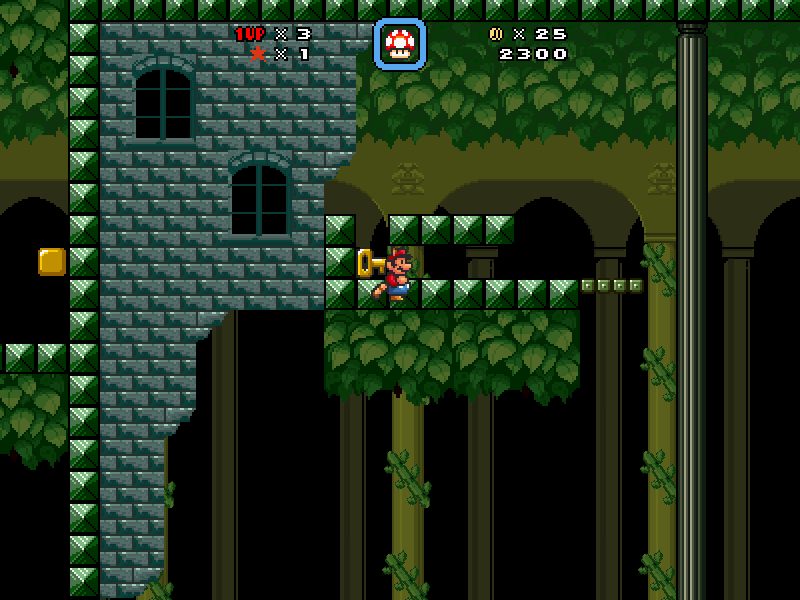 Fifth, the midpoint is just above here, and since the player is barely unable to make this jump normally, the player has to fly up to get it. 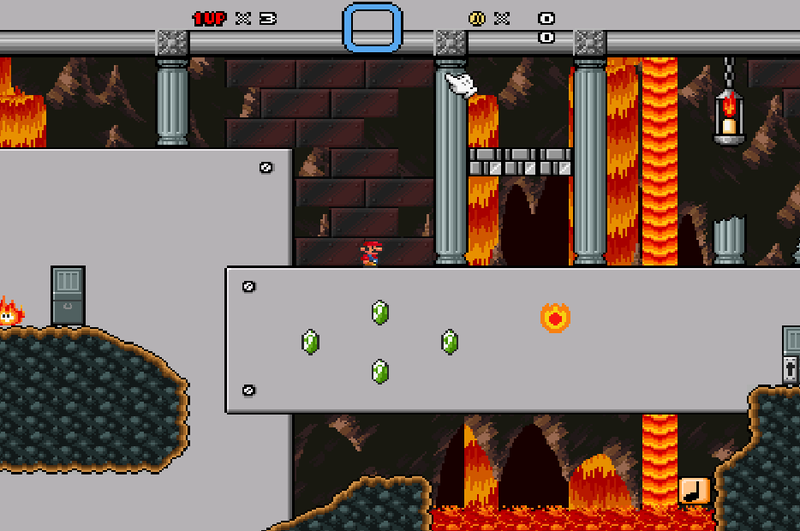 Sixth, once the player gets the checkpoint, the level forces the player to make the same incredibly difficult flight run again because the only way to progress is to fly under this wall, which extends above the section boundary. Because of all of those facts, the grass temple is the hardest level in the pack (aside from the earth temple, sky temple, and the time temple, all of which are currently impossible). Also, this door just leads back to the beginning of the section, which is completely pointless. 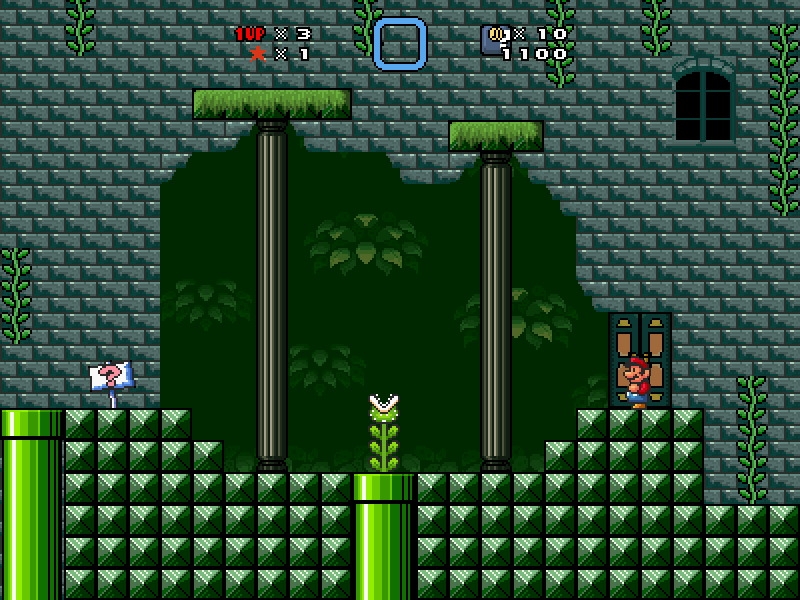 In case you didn't know (which it seems like you didn't), it is possible for all Super characters (characters that got a Super Mushroom and are big) to duck-slide into one-unit high tunnels. 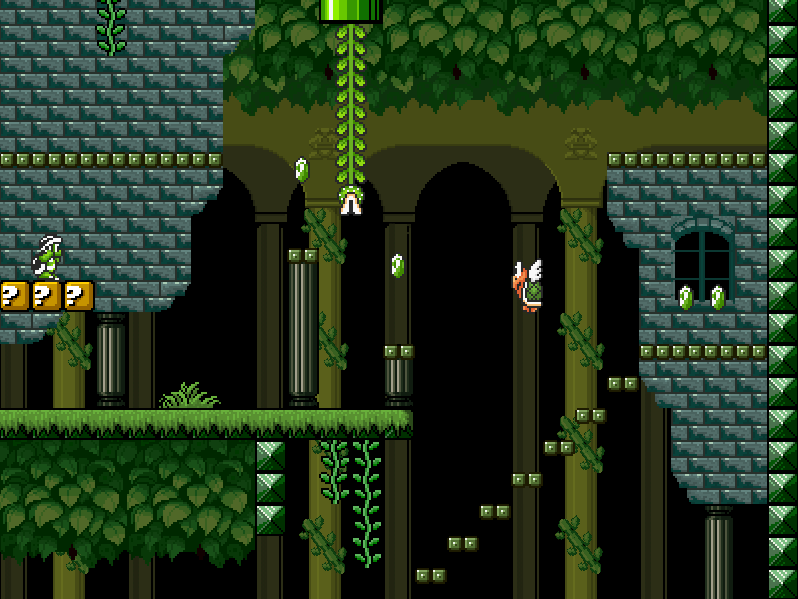 On top of that, if the player turns around and stops ducking, he/she begins to phase through the tunnel in the direction opposite of which way he/she is facing. 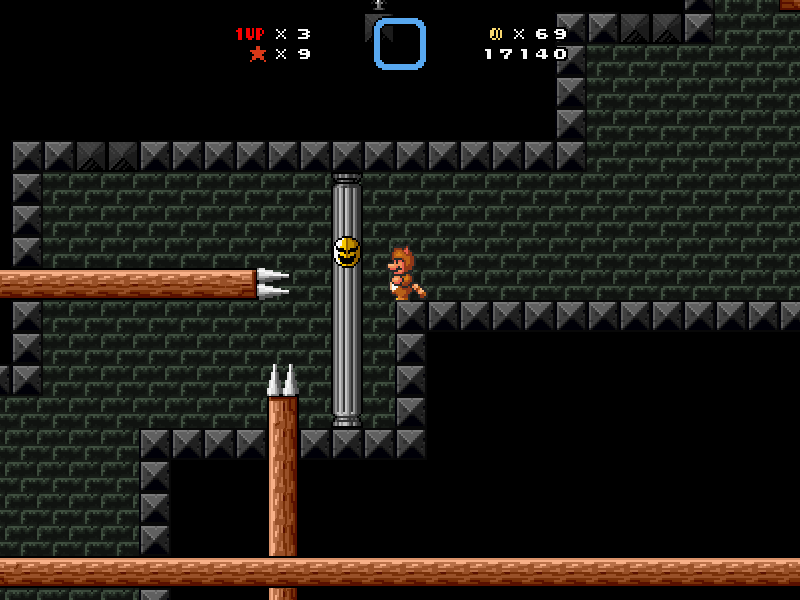 I did this to slide through the tunnel and break the brick with the racoon tail. 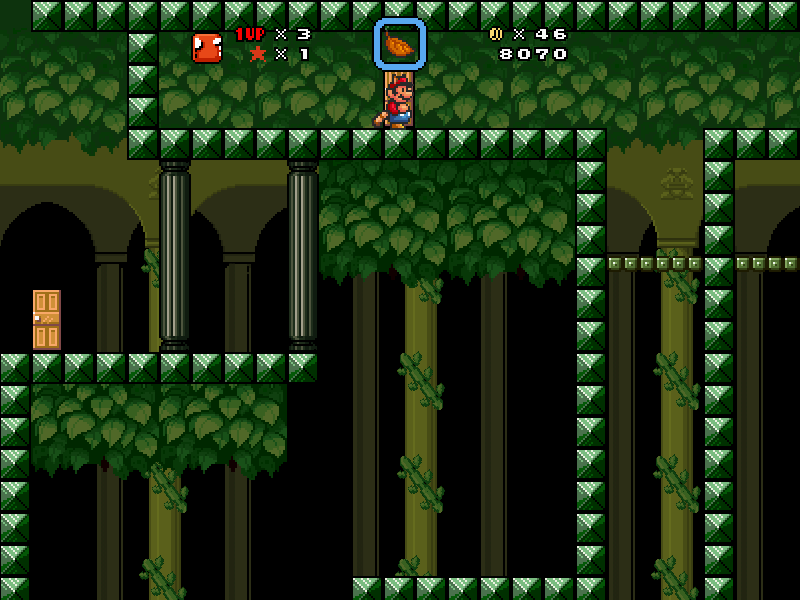 The grass temple's boss wasn't anything special; it was just the commonly-used Koopa Bros. sprite-swapping Ludwig in a flat, empty room with a vine that would occasionally disappear and reappear. 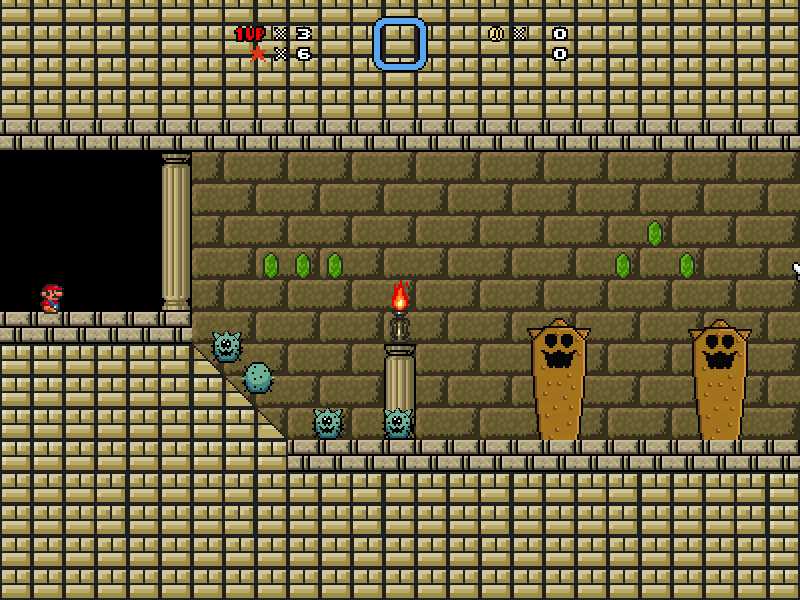 Also, in (almost) each temple, you have power-up generators near the chest that the player gets his/her first one from (and a few other places throughout some levels). First, I recommend adding a pipe so that it doesn't look like the power-ups are coming out of solid ground (or ice or whatever). Second, I recommend decreasing the delay to at least half of what it is now so that the player doesn't have to wait so long to be fully powered up. For starters, its rules don't make any sense; why would a door being underwater cause it not to open? 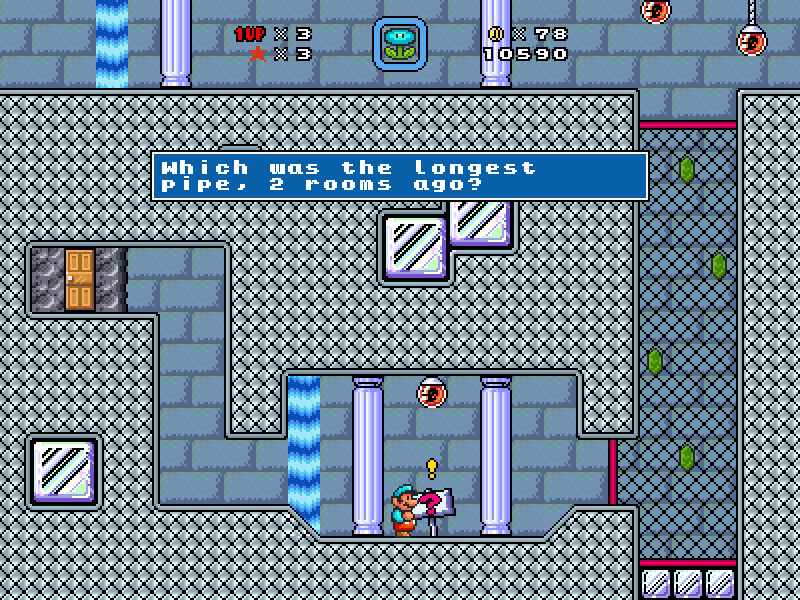 Furthermore, why would a pipe not being underwater cause it to be inaccessible? 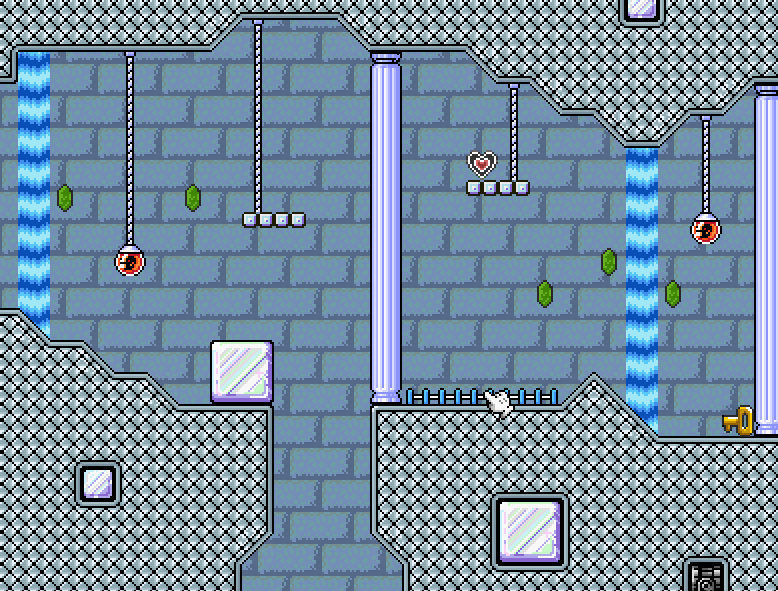 I think it would be much simpler if you built the level around the raising and lowering water gimmick so that the warps you don't want the player to enter become inaccessible after the water is raised/lowered; you did it a few times, so I'm sure you'll be able to do it for all of the warps. 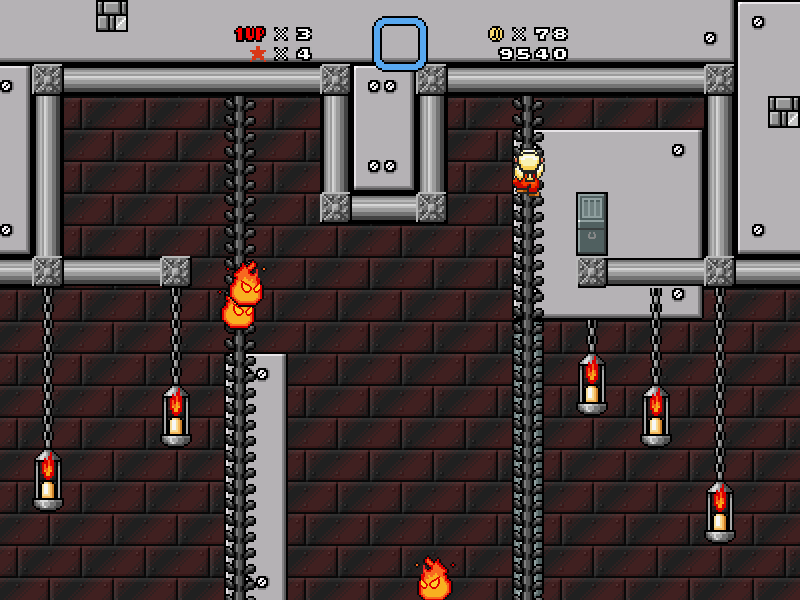 Plus, it would allow you to replace the locked pipe with a locked door, and this would be extremely beneficial because locked pipes are unintuitive as heck! I missed the key on my first play-through, and I seriously thought that you simply forgot to put a warp there at first. The least you could have done would be to have a sign in front of it saying that it's locked. 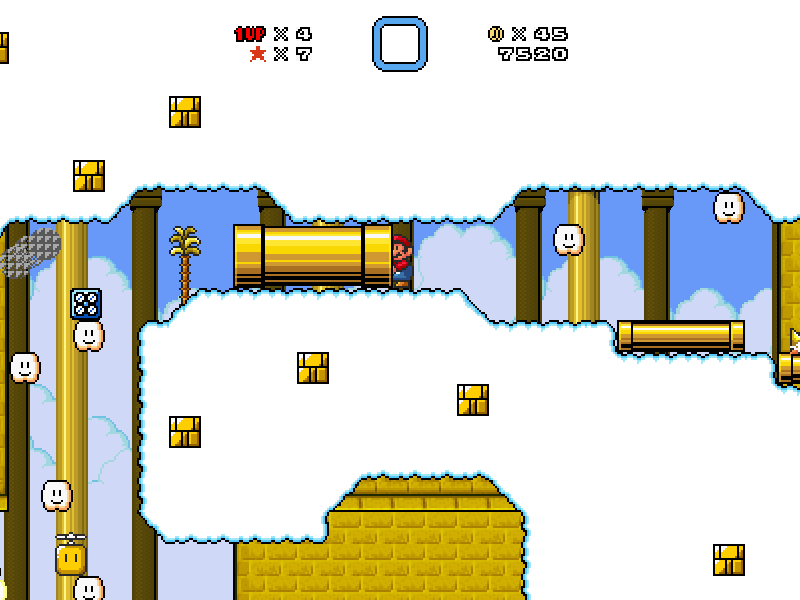 I'm glad that you made a work-around for the fact that Bullet Bill Cannons can be killed with ice, but the implementation of the secret star was awkward; maybe you should only have one Bullet Bill Cannon in the room with the secret star and make it just an ordinary Bullet Bill Cannon (not a generator). Also, you forgot the apostrophe in "Captain's." Also, never use transparent foreground objects as water; it just makes your level an eyestrain to play on top of making it difficult to tell where enemies are. Seriously, how can you look at this for so long without your eyes beginning to hurt? It wouldn't be so bad if they were background objects, only causing the background to be discolored. 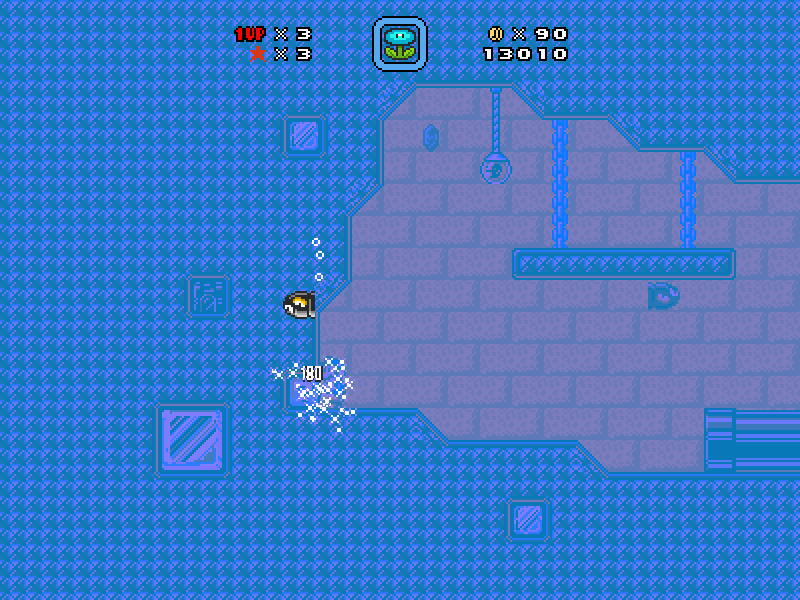 Also, slippery physics don't work well underwater; if the player is at a standstill, he/she can't move without jumping. Remember when I wrote that I missed the key on my first play-through? 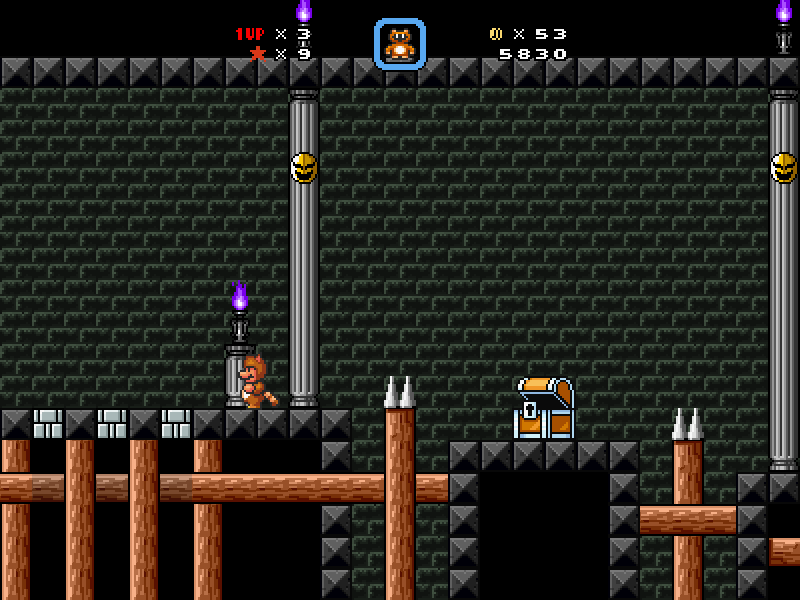 Well, I figured that I missed something when I ended up right back where I was, so I went back to this section, and since the switch was already hit, but the I had to raise the water again to get back to the main shaft, and since hitting the switch causes the section to set itself for some reason, I ended up stuck here and couldn't do anything except kill myself and start over. 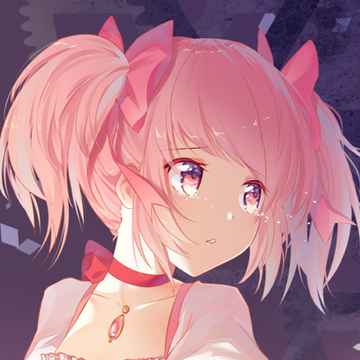 You should avoid making it possible for the player to get stuck to the point that he/she has no choice but to either kill himself/herself or close the program entirely. Also, way to go, pulling a random memory quiz out of the blue. Not only is there nothing before this message to indicate that the pipes were anything other than decoration, but you could have had a puzzle in its place. I don't have any suggestions aside from "don't do this;" if you can think of something better to replace it with, then go for it. If not, scrap the section entirely. This part is also annoying, and not just because the crappy foreground water returns. What the player is supposed to do is hit the ? 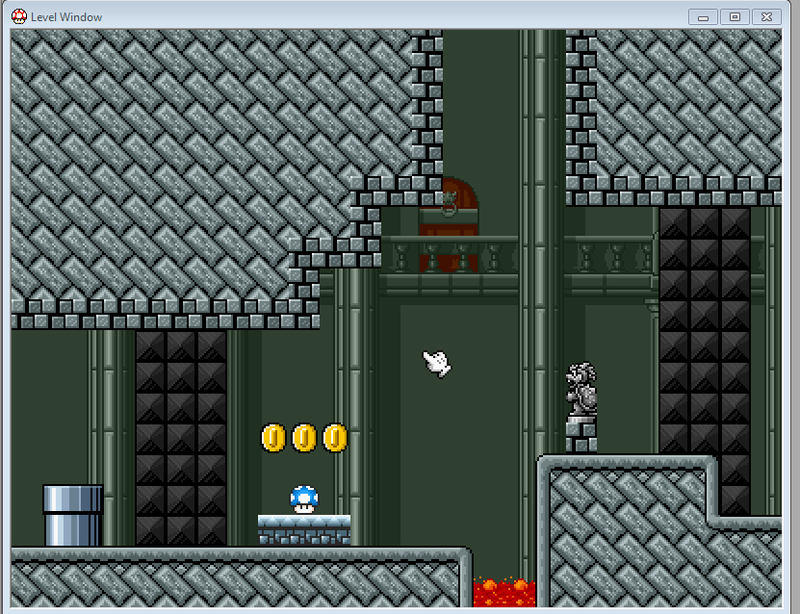 block with one of the ice blocks that's generated in the previous section, then get the rupee before it disappears. The annoying part is that if the player messes up, he/she has to go back to the previous section, grab another ice block, and return here to try again. That may not seem like much, but the warp between sections is a pipe, which makes the transition take longer than necessary. 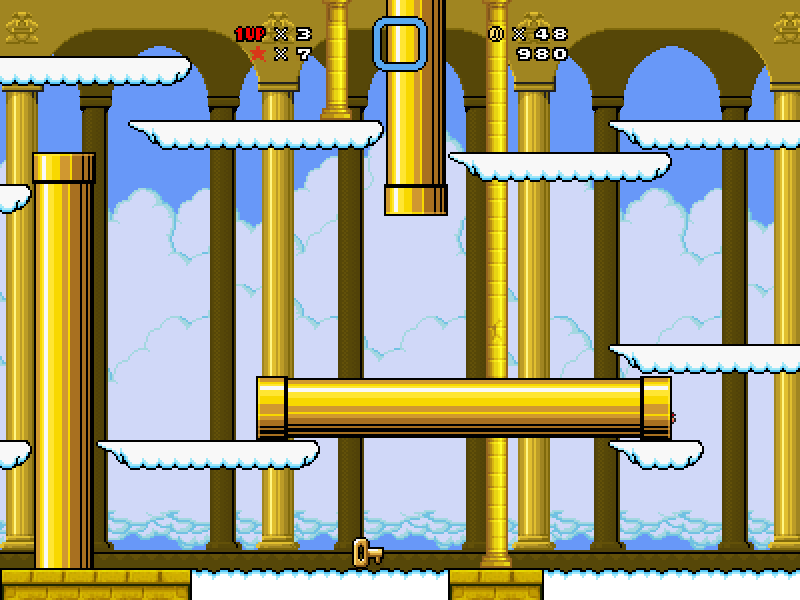 Plus, there's no indicator for the ice block generators (on top of the fact that the crappy foreground water obscures vision), so first time players will miss them and think that he/she has to use a frozen Bullet Bill to hit the switch with. 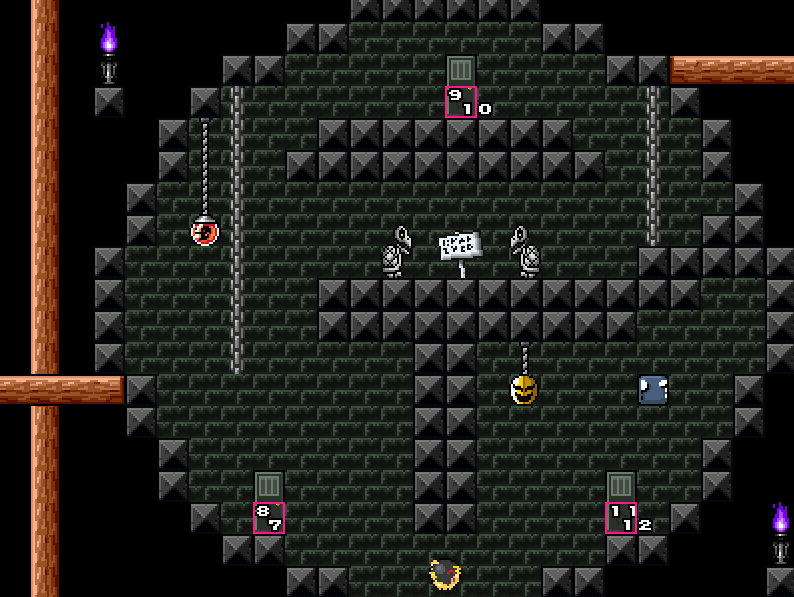 Anyway, it was around the time I made it to the boss when I realized that there isn't a checkpoint in the entire level! 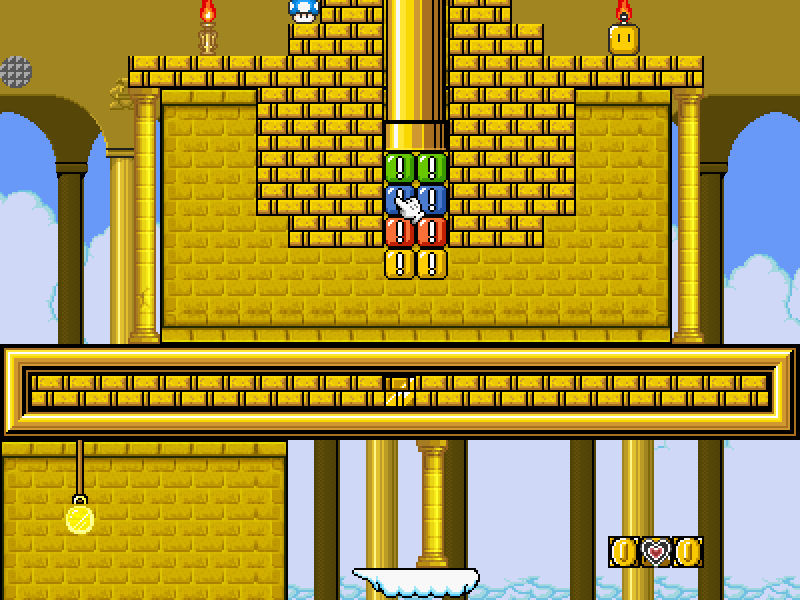 I'm sure that you know that this level is too long not to include one, but I think that you'd realize that it was missing one if you tested it. 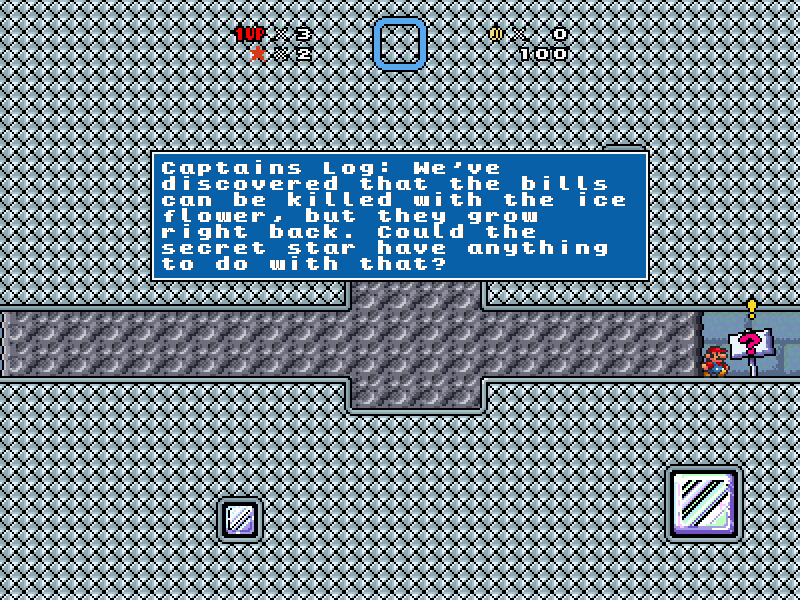 Anyway, I recommend placing the midpoint in the boss's room (around where this screenshot is) since, aside from the aforementioned place where the player can get stuck and be forced to kill himself/herself, the player can easily make it to the boss's room from the start point in one life. 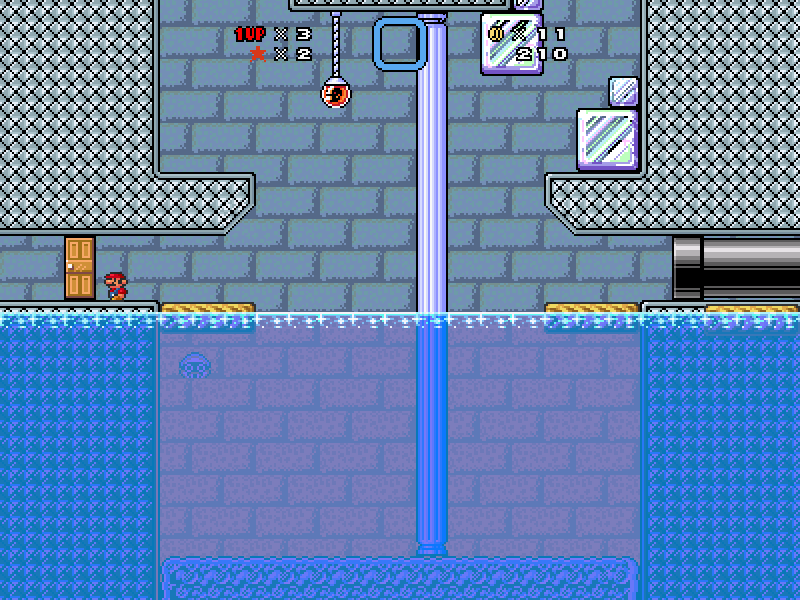 The difficulty of the water temple's boss is difficult to determine. On one hand, it's a relatively large SMB1 Bowser sprite swap, and since SMB1 Bowsers throw hammers at semi-random intervals, it can be near impossible to time a jump over one, especially one as large as the one you used. 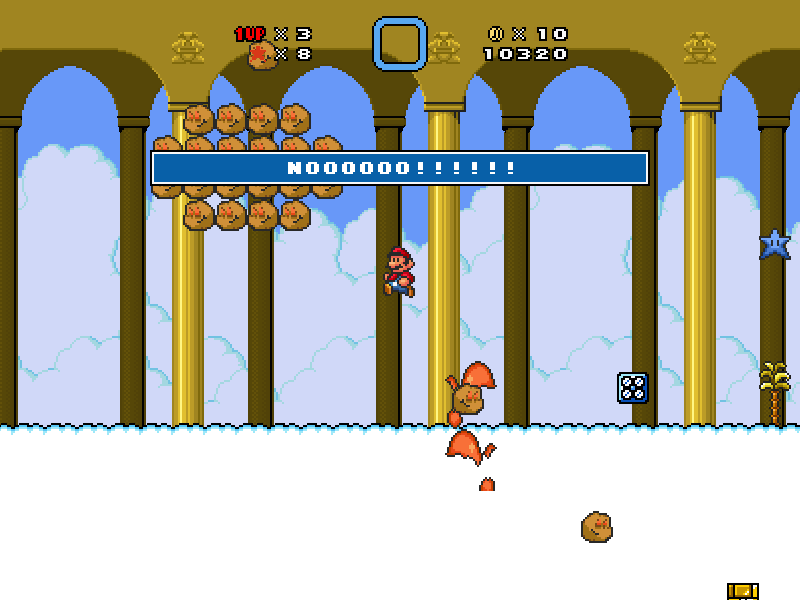 On the other hand, once the player makes it over the SMB1 Bowser sprite swap and grabs an ice block, he/she can just hold it next to the SMB1 Bowser sprite swap, causing it to take multiple hits and be killed almost instantly. It's more luck-based than skill-based, honestly. 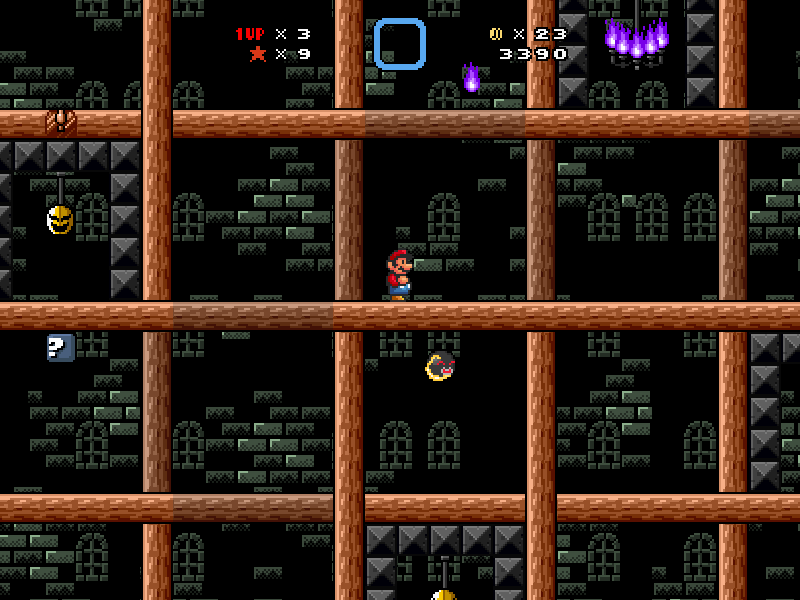 Also, why did you choose to have the star appear to the right of the boss's platform instead of above the center? 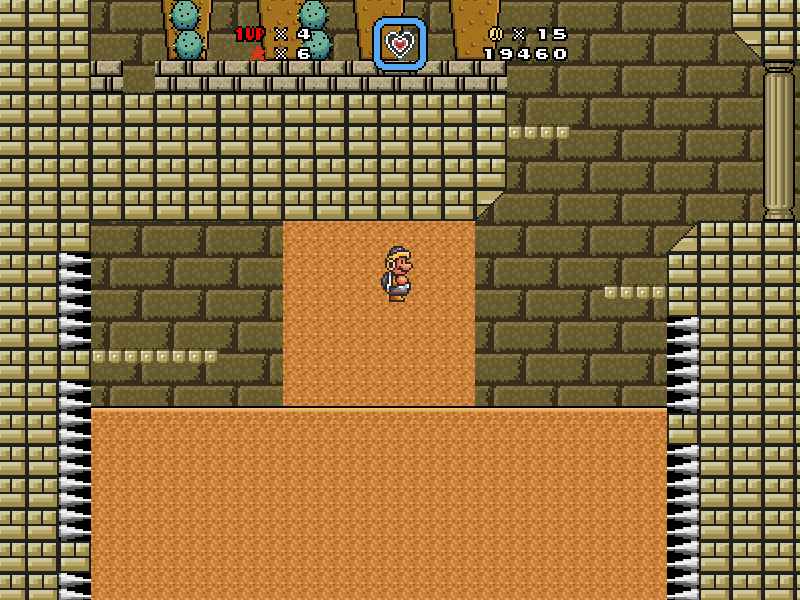 Having it appear near the center of the stage is more convenient for the player. 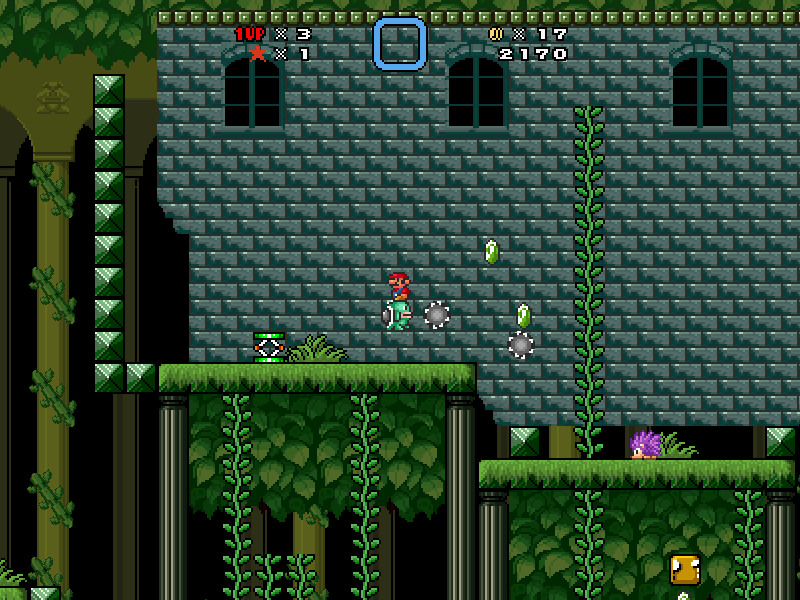 This dark grass sprite-swap is difficult to see among the dark background and dark tile-set. Plus, it's in a place that the player won't think to look. I recommend making the grass a brighter green and moving it up beside where the door is. This section isn't very kind to first time players. 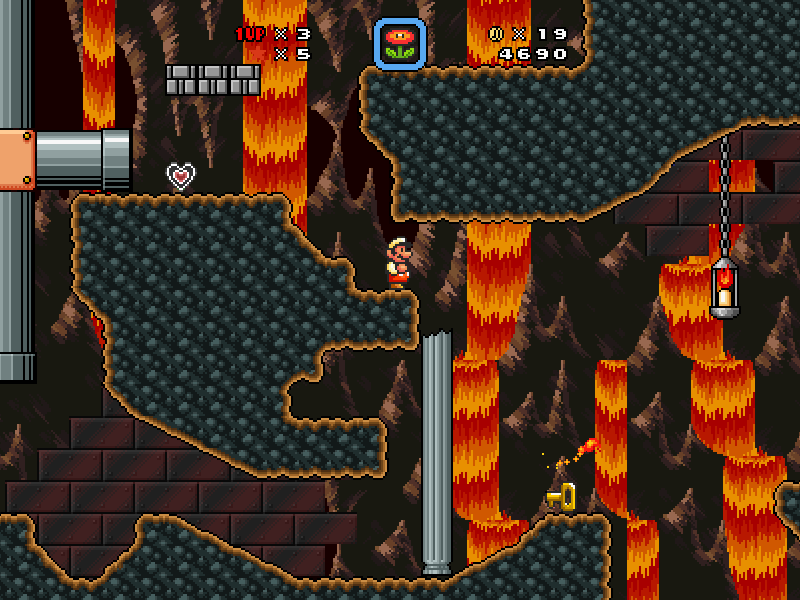 Not only is it tricky to figure out how to blow up the rock wall with without taking a hit (even knowing that you have to throw a fireball), but the fire flower generator is so far off-screen, it's barely noticeable and just looks like a bottomless pit at first. I didn't even notice it until around my fourth time going through the section. I recommend moving the blocks down there up by two units. 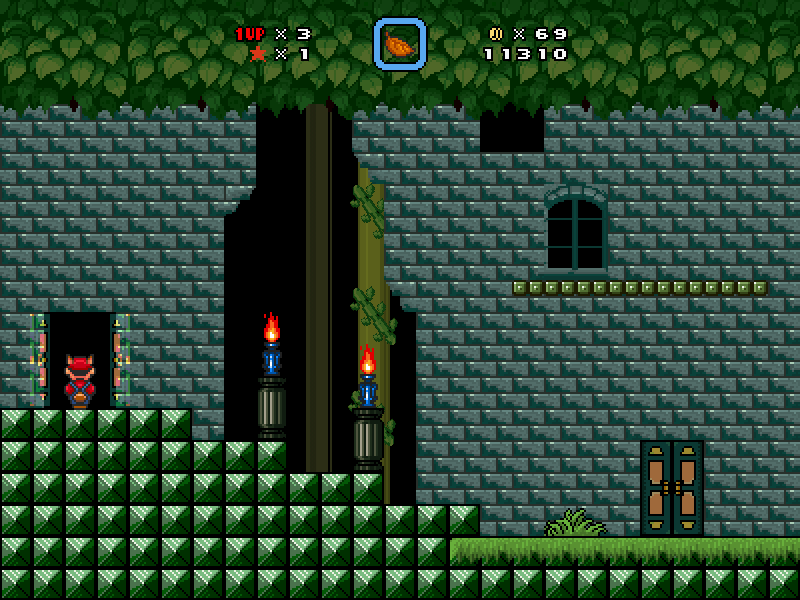 For this part, why do you have vines go up to both corners if there's nothing on the upper-left of the section? Maybe you could make the ? block on the left a switch block instead (to give it a purpose). Also, I just noticed some minor cutoff with the chain and the pipe on the right. 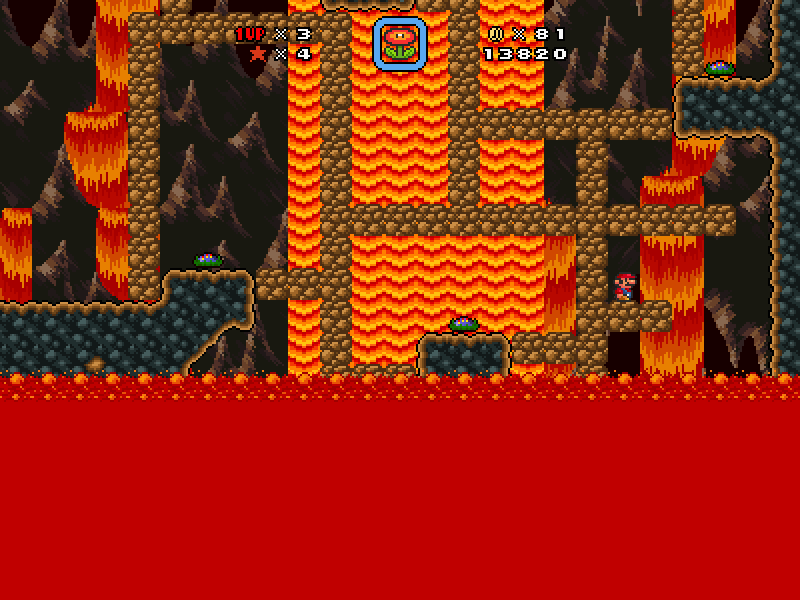 This section's chasing lava also isn't kind to first time players; not only is it difficult to find where the grass sprite swaps are due to the aforementioned dark background and dark tile-set, but there's also no indication that the lava has started rising, so players won't notice until it's too late. 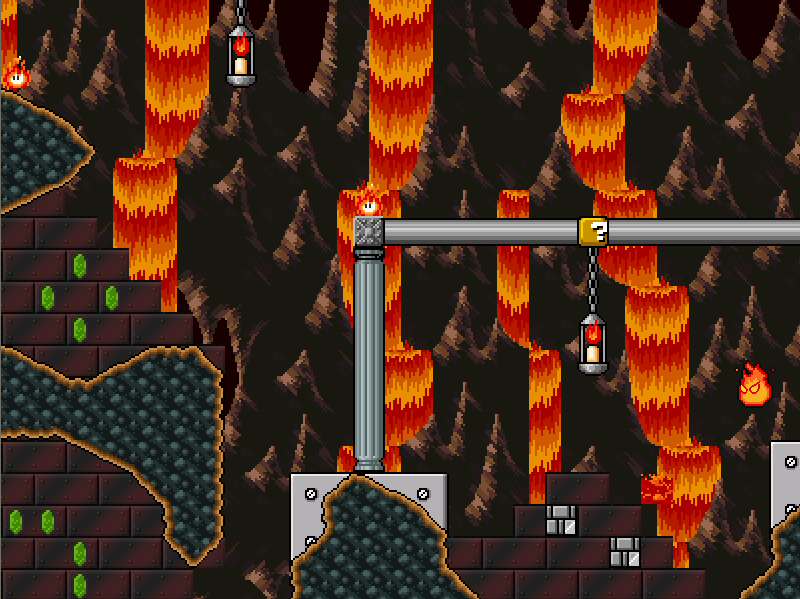 Plus, the entire section can be broken by simply blowing up the rocks on the left since they don't trigger the lava. 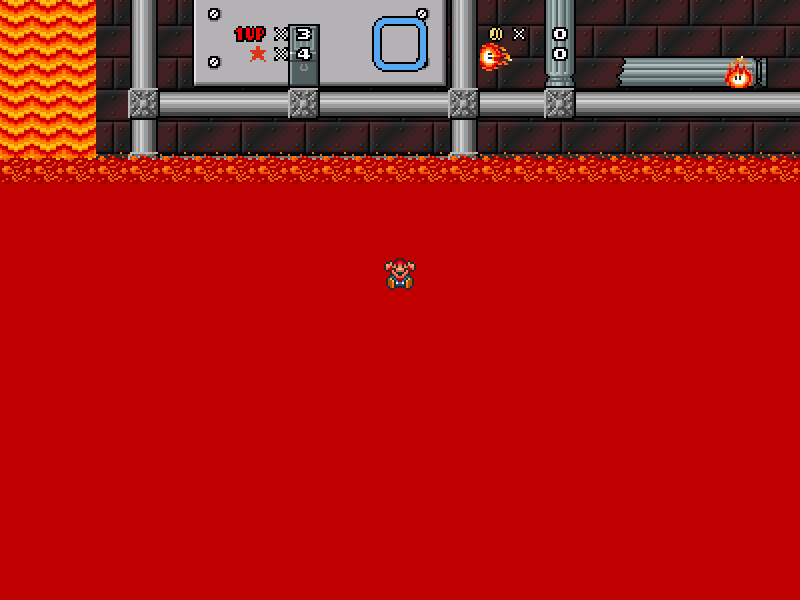 ...if you didn't have the midpoint trigger an event on its death that hides the lava? 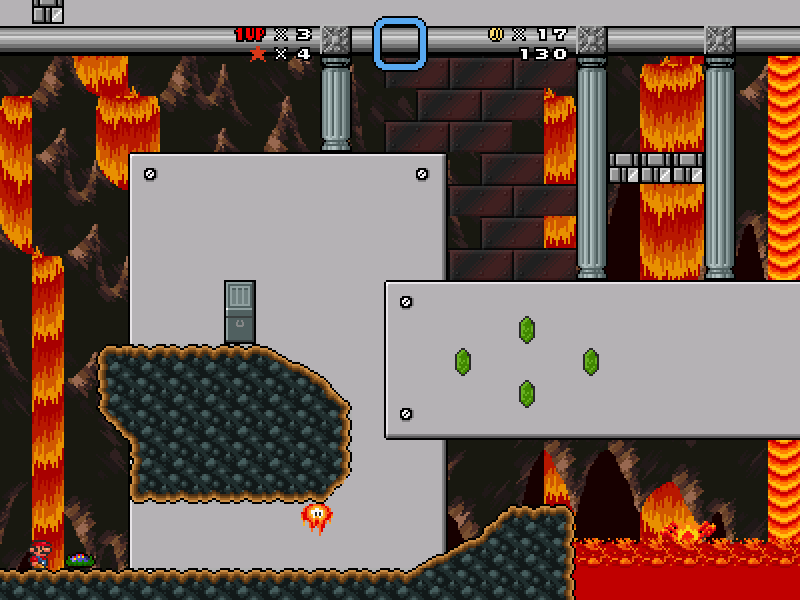 The way the level is now, if the player realizes that the secret star is before the midpoint after getting the midpoint, he/she won't be able to go back and look for it because the lava blocks access to the earlier sections. 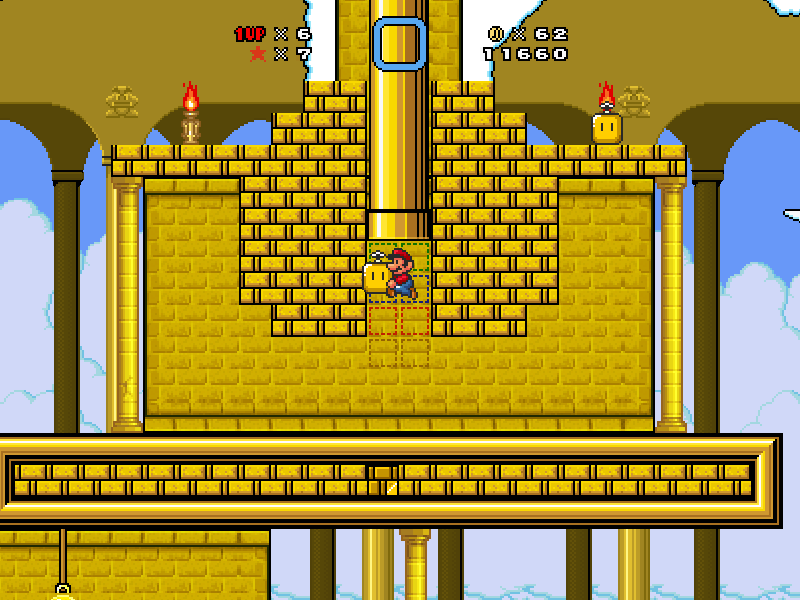 Anyway, the reason that the secret star's location is unintuitive is because there isn't any indication that this part of the pipe has a warp attached to it; the spike-top sprite-swaps are being generated from the top, and since the bottom is relatively difficult to reach on top of having no indication that it will lead anywhere, most players will think that the pipe is solely for the spike-top sprite-swap generator. 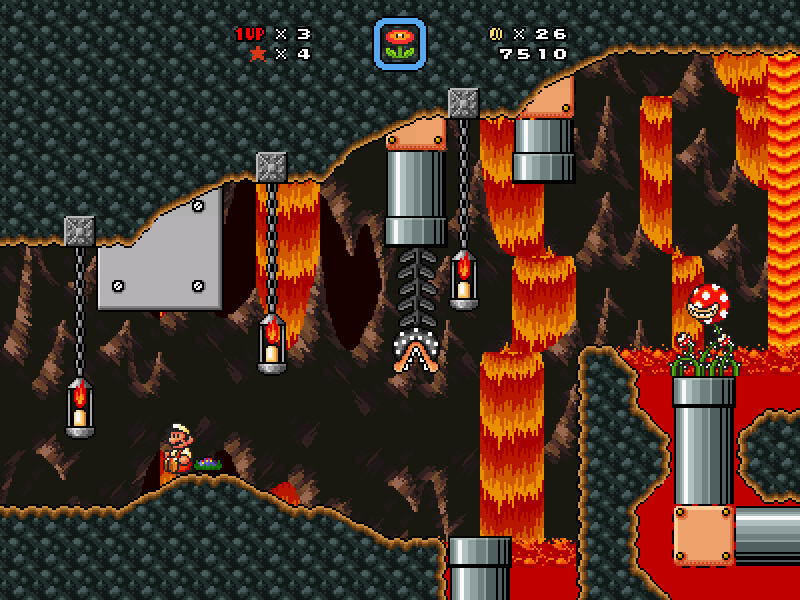 Also, the reason I thought that the secret star was at the top of the chasing lava section is because the player can make it to the boss's pipe by throwing the key upward, then jumping off of it when it bounces. 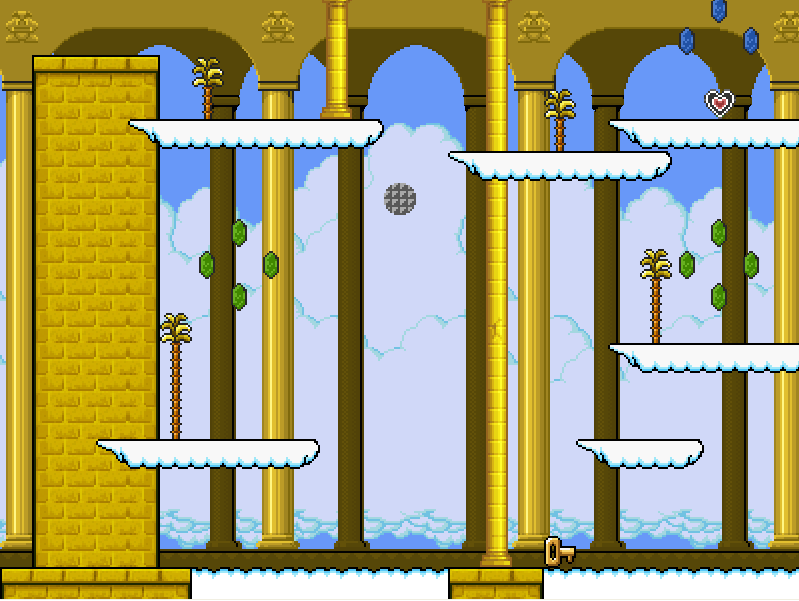 If you're unfamiliar with SMBX's bounce mechanic, this level will teach you the basics. Seriously: if the player's aim is slightly off, he/she will just end up sliding instead of ducking. Remove the slopes; it's really annoying! Also, decrease the generator's delay by at least 4 seconds; it can get boring having to wait for the next bomb flower to generate. 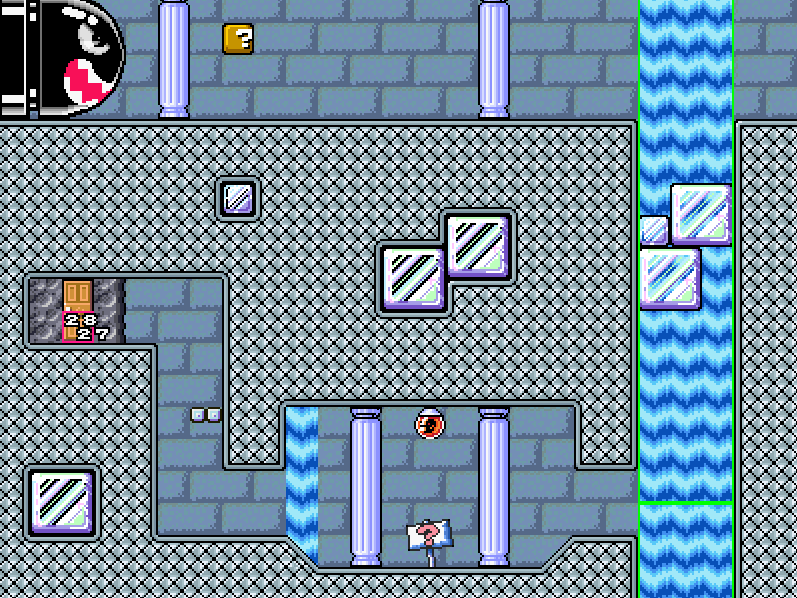 Also, you didn't give block-575 its proper mask sprite, so it has transparent areas when played in SMBX 1.3.0.1. This temple's song wasn't in Ocarina of Time, and you didn't properly label it. In fact, you didn't properly label any of your custom songs! It really bugs me when people don't label their custom songs because it's not that difficult to do and because music is just as important to levels as its custom graphics, which the community puts more emphasis on crediting for some reason. Anyway, my question is this: where are your custom songs from? You shouldn't put Pokey stacks by slopes because they'll just fall off of each other (unless you intended for this to happen). Don't use so much quicksand in your levels. 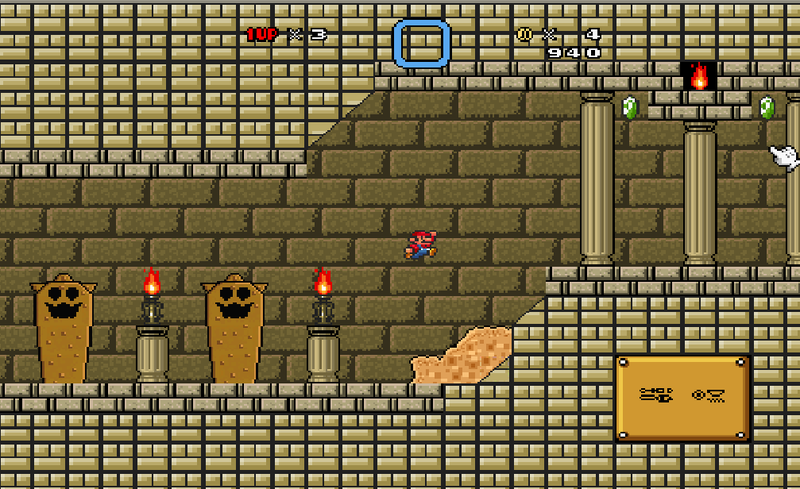 I know that this is supposed to be the earth temple, but all quicksand does is slow the player down, meaning the level becomes very tedious very quickly. 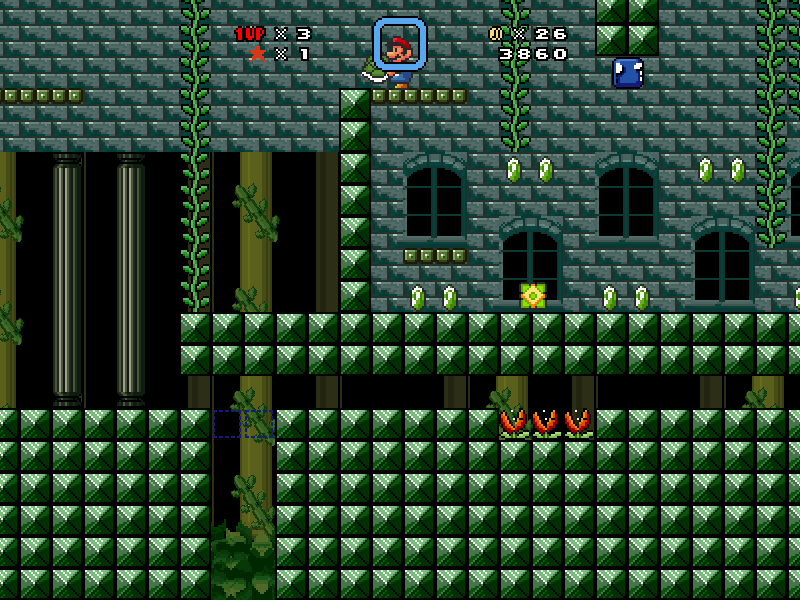 Seriously, don't force the player to go through so much quicksand; it just makes the level slow and boring. 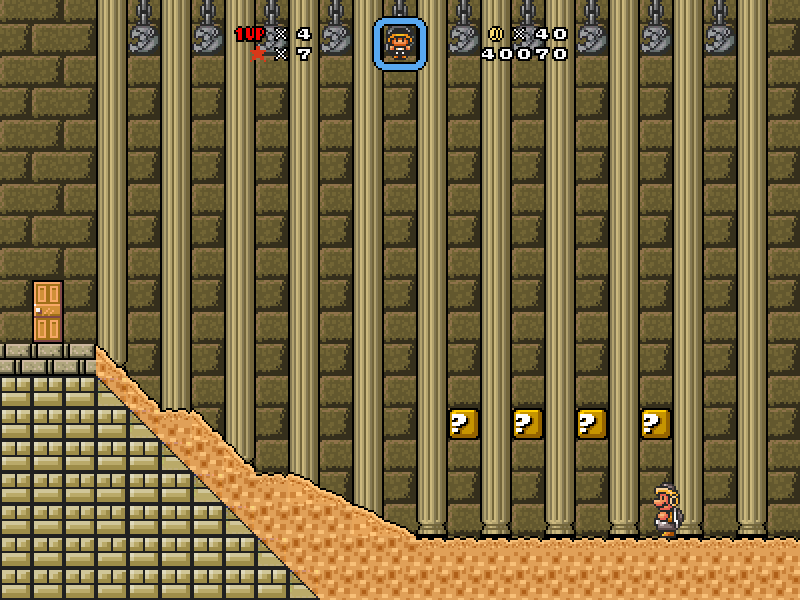 If you find it absolutely necessary to use quicksand, try to use as little of it as possible; perhaps only one or two separate columns, but not this much (the rising quicksand pool is okay, but this quicksand-fall isn't). A pretty big design flaw that you made is if the player jumps down here without getting the key, then he/she can't get back up and is forced to kill himself/herself. Another equally big design flaw is that if the player dies after getting the checkpoint, there's no way to get back to the main part of the level without cheating. Also, you didn't provide any hint for this guessing game. I got lucky by guessing correctly, but other first-time players (and possibly even second and third time players) won't be so lucky. Since I know that the third one is correct, I can assume that it has something to do with the rupee pillars earlier (which was clever, by the way), but since you didn't say anything that even hints back to that, there's no way for players to get the correct switch outside of trial and error (or looking in the editor). 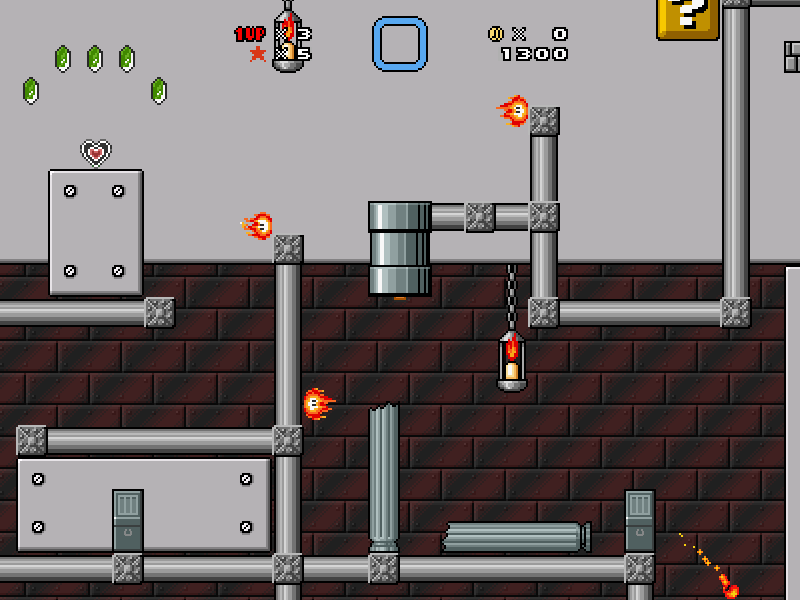 The boss is annoying to fight because not only does the player have to go and hit the switch to spawn a shell each time, but launching the shell up the ramp just causes it to ricochet off of the corner in the ceiling, meaning the player has to throw the shell over the ramp in order to damage the boss. Plus, defeating the boss does nothing. The only star in the earth temple is the secret star. Because defeating the boss does nothing, the player is forced to kill himself/herself again, and this is supposedly the updated version! What the heck?? 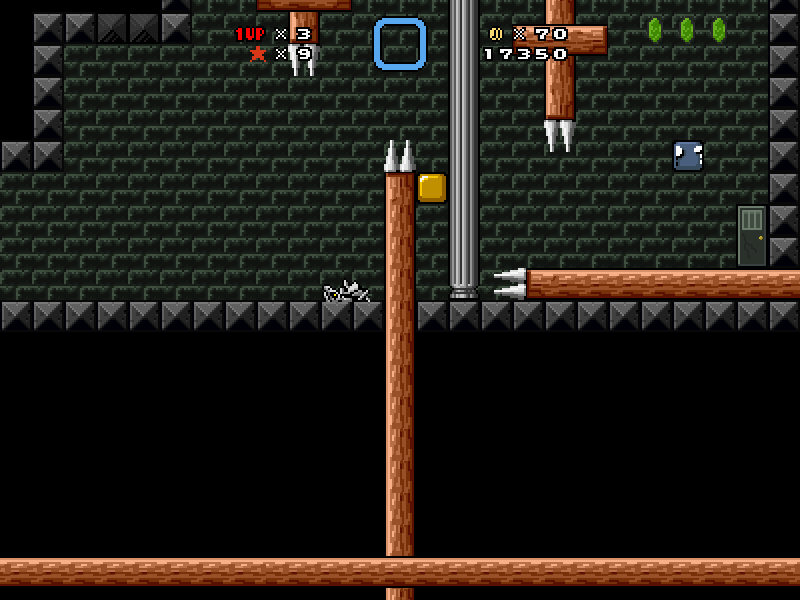 First, I'd like to say that the way you indicate invisible blocks in this level is quite clever. Now, I'd like to point out that these two pipe transitions are completely pointless. Both can be removed and the level would lose nothing. 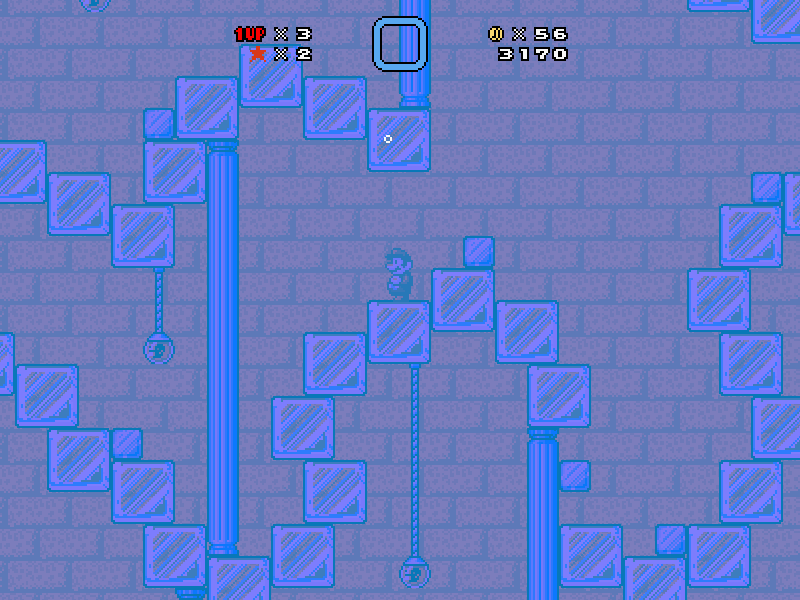 In fact, removing the pipes and their warps would make the level more streamlined. 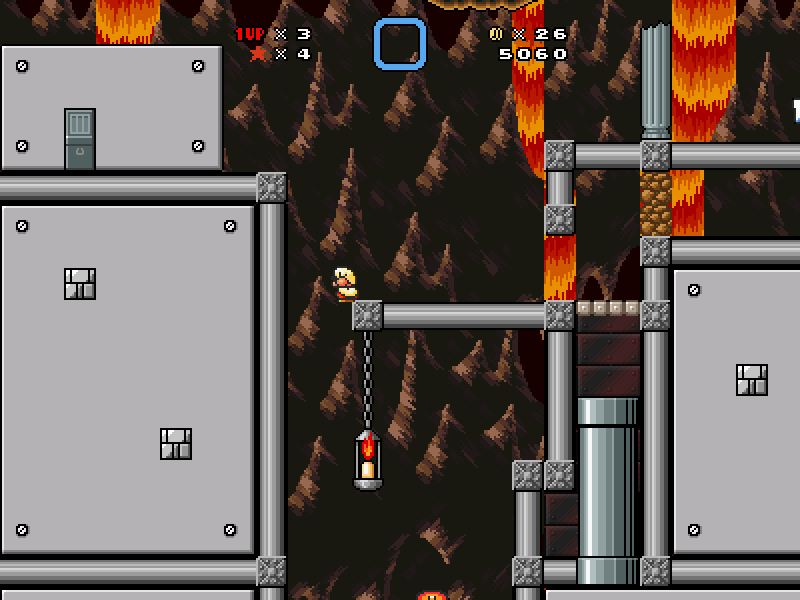 Admittedly, for this pipe, you'd have to add a cloud platform so that the player could make it back up to the top pipe, but my point still stands. Having the midpoint up here does nothing to benefit the player if he/she will just have to go and deactivate all of the switch blocks again after getting killed. 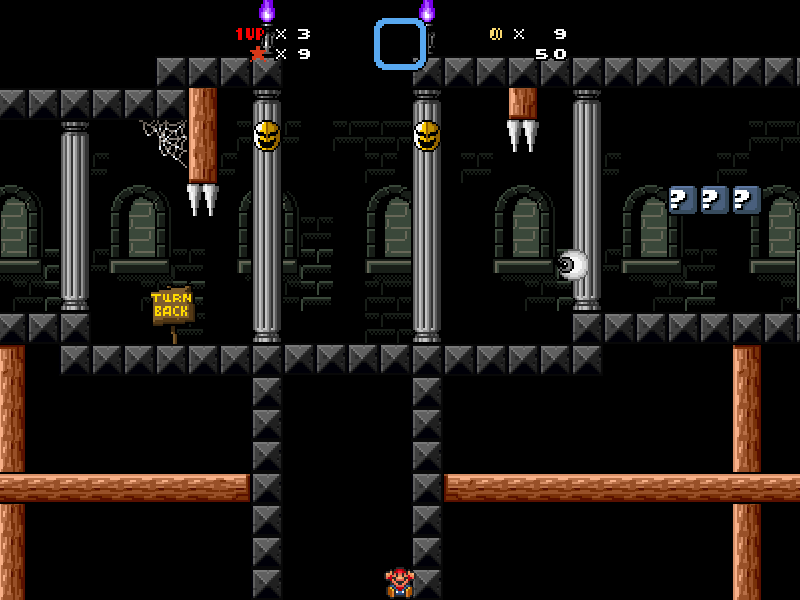 Because of the way the level is designed, the player already has to deactivate two of the switch blocks in order to get here. 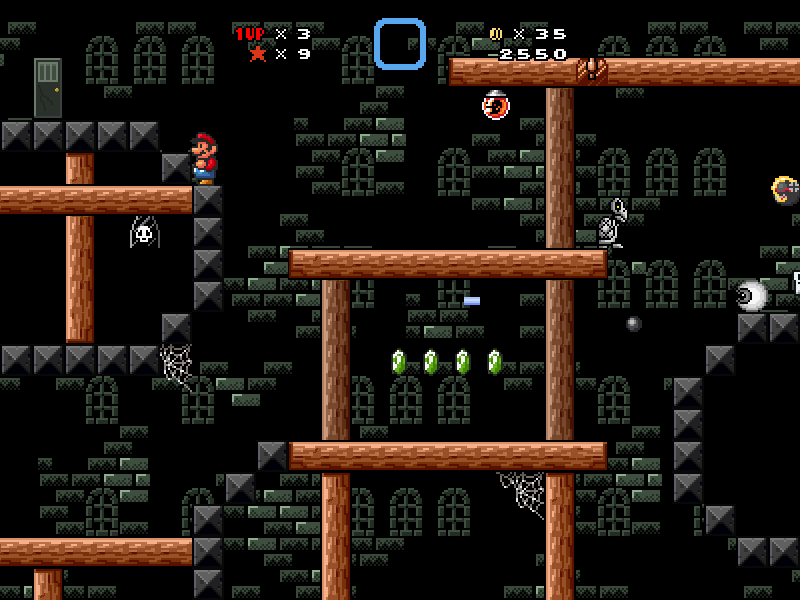 Therefore, if the player dies at any point in the level, even if the player got the midpoint, he/she would basically have to start the entire level all over again. I recommend moving the midpoint to the boss's room. But wait, there's less! 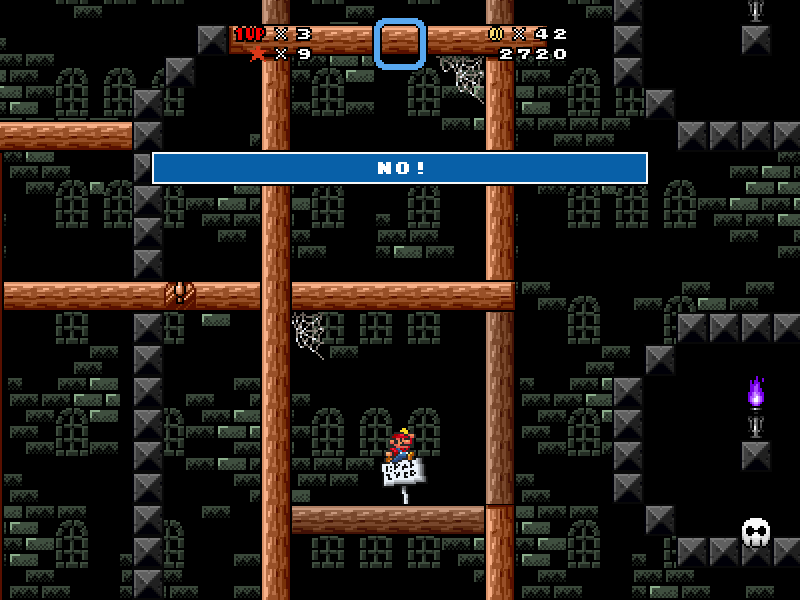 Even if the player does deactivate all of the switch blocks, he/she won't be able to enter the boss's room in the first place because there's no warp there! And no, it's not another locked pipe or anything like that; I looked in the editor, and there simply isn't a warp there. Again, this is the updated version. How did you miss this during testing? Did you even test this? 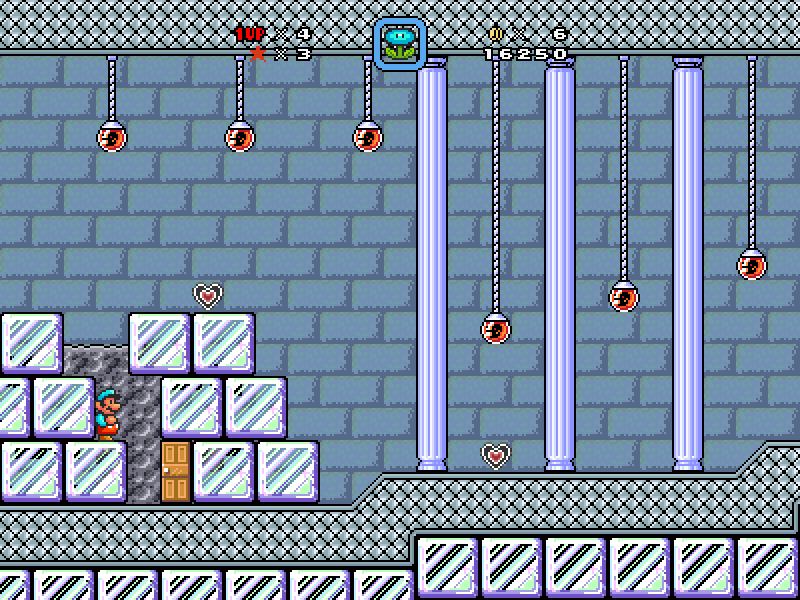 Speaking of missing stuff, this level's secret star is extremely miss-able. 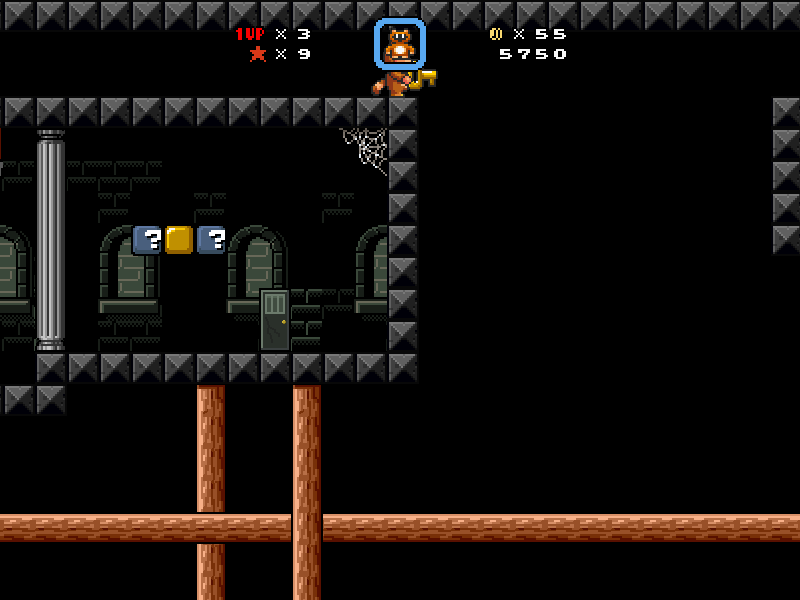 I easily found the hidden block that reveals the star, but there's no indication that what changed was in the same section (after all, multiple blocks in your previous levels changed stuff in different sections), so most first time players will think that something changed elsewhere. 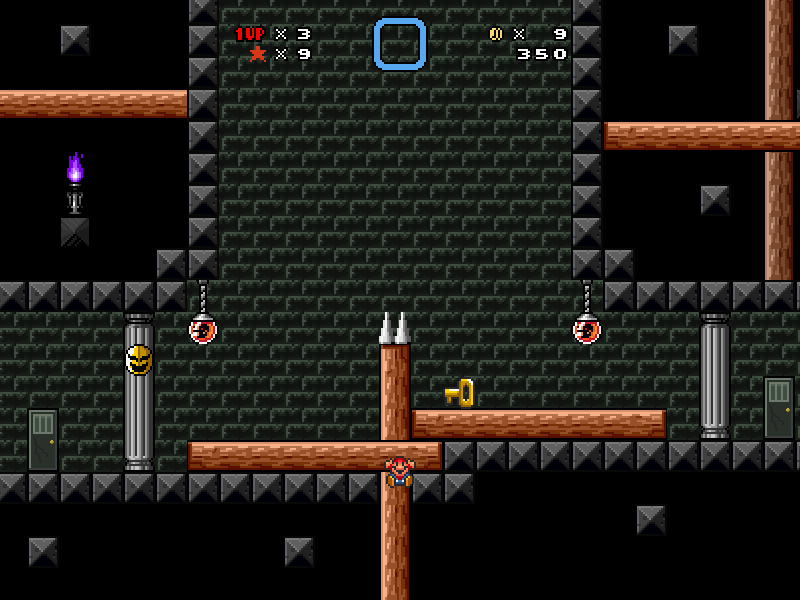 Very few players will backtrack through the section that they literally just finished going through just to see if the hidden block revealed a secret in that very section, especially since players won't be able to backtrack from where the switch is, meaning they would have to backtrack through two other sections just to get a propeller block to go back to the entrance of the section that they just finished going through in order to check to see if something changed in the section that they literally just finished going through. Did I mention that the player just finished going through the section by the time they reach the hidden block that reveals the star? I recommend having the switch create an opening to the right of the secret star (near the exit pipe) instead of above it. Also, this Spiny generator is difficult to predict because of its long delay. First time players won't even realize that it's there at first and may even take an unfair hit because of it. I know that you didn't make this sprite swap, but it's still your responsibility as the level creator to choose graphics that work. You shouldn't put spikes where the player can't see them. This is already a blind jump for the player (albeit an intuitive one), so having a spike here means that first time players might fall into it and be unfairly killed, like I was. Remove the spike or lower the upper platform. I know that the sign says "TURN BACK," but this sign has always been used as decoration instead of an actual warning. I recommend adding an NPC sign that says "Woe to those who don't heed our warnings" or something like that. 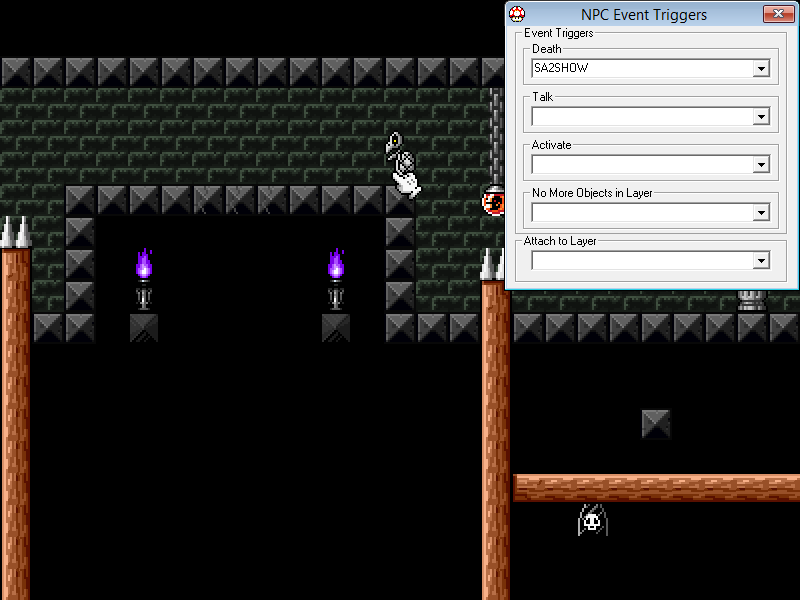 Killing this NPC is probably the most unintuitive thing you force the player to do. 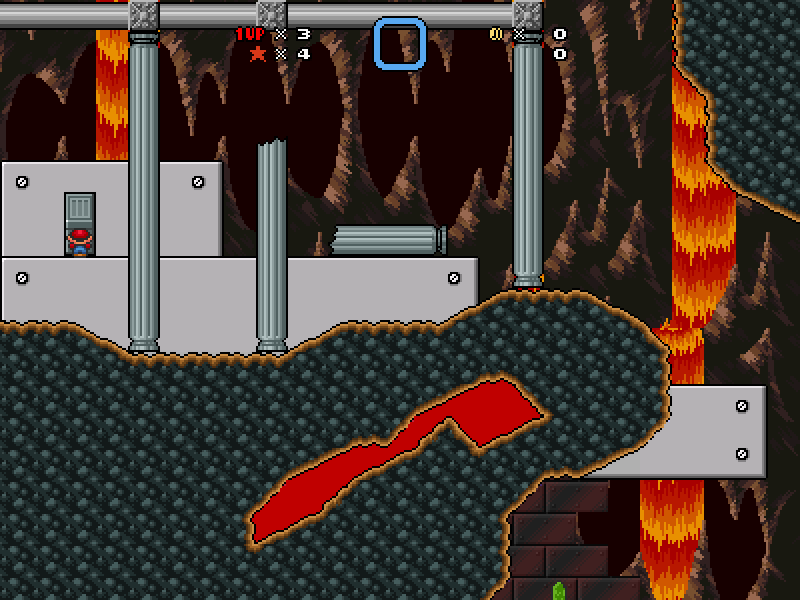 Even if the player thinks to stomp on it when it's on the doughnut block sprite swaps (which are barely any different from the level's normal blocks) and make it fall down, the lava is off-screen, so the player will think that the dry bones has already fallen off-screen and been killed. 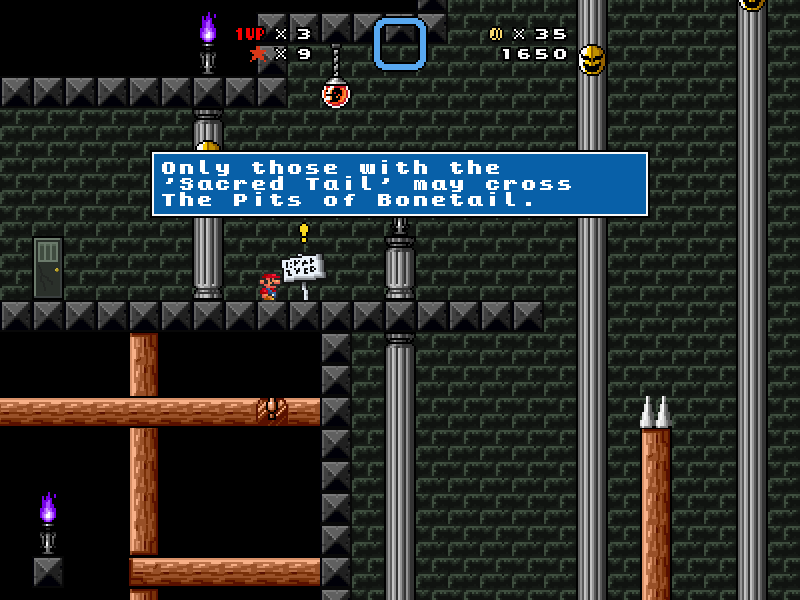 Plus, the dry bones doesn't get killed by lava when it's collapsed, so if the player off-screens it before it can stand up and be killed, the player will have no idea how to proceed. Even if it does get killed, it will be long after the player has gone off to do other things, so chances are the player won't realize that killing the dry bones is what opened the way forward. Even if the player does figure out that he/she has to kill the dry bones, he/she has to stomp it, drop it down to the lava, then wait for it to stand up and kill itself, and waiting = boring = not fun. 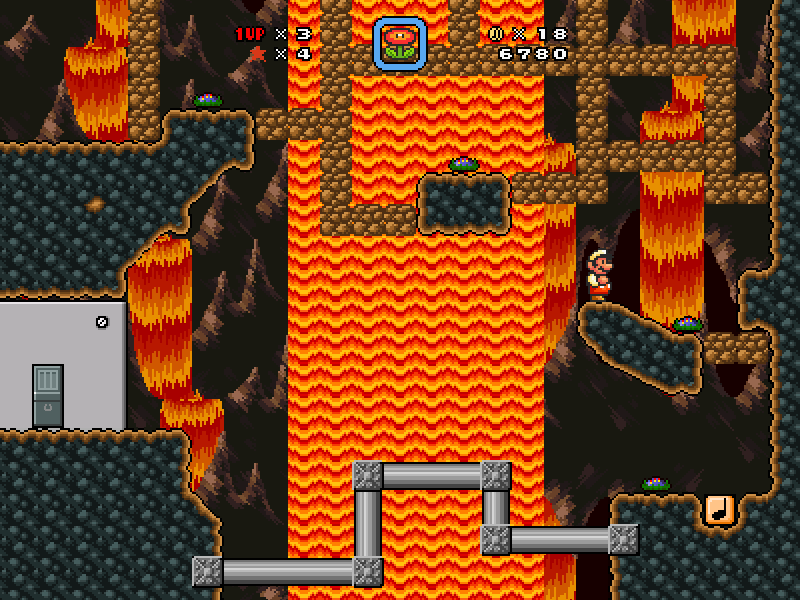 The least, the borderline least, you could have done would be to move the lava on screen and maybe add a sign that says "be patient," but I recommend changing this part entirely so that the player doesn't have to wait so long. 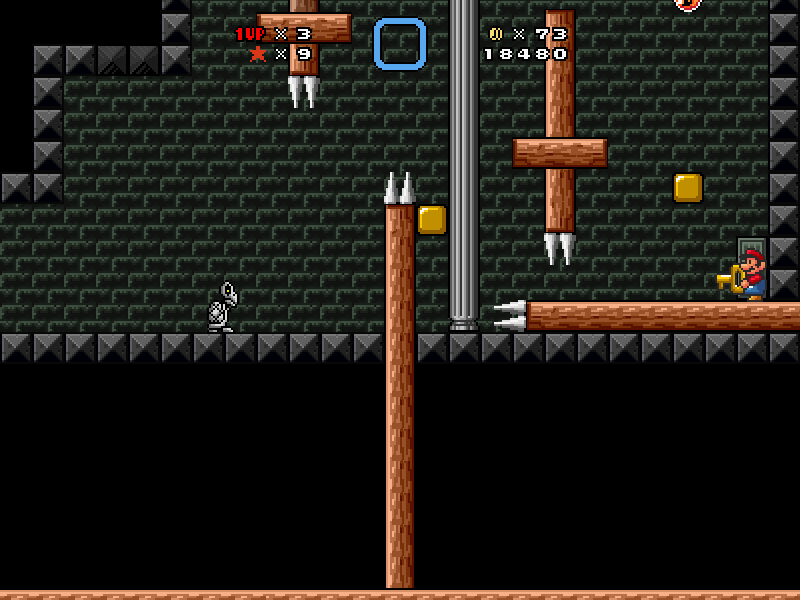 This is especially annoying after getting killed on the later parts of the level before the midpoint. 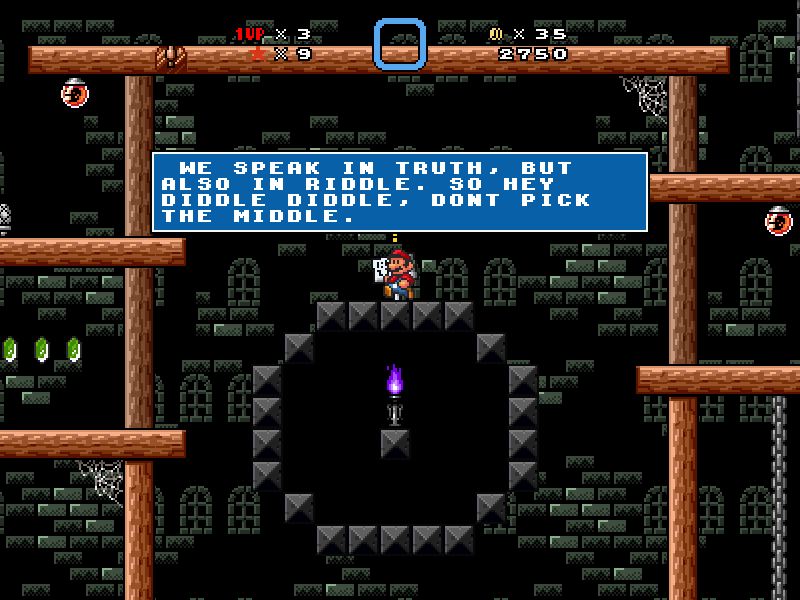 By the way, the signs of truth shouldn't just be a random gimmick for a single section; it should be a consistent theme throughout the entire level. First time players won't know that the truth signs are limited to that one section and might interpret signs in other sections as lies. You forgot to sprite-swap the laser's effect; it still appears as a Snifit's bullet. Your rhyming here is...amusing. Also, you accidentally put a space at the front of the message. 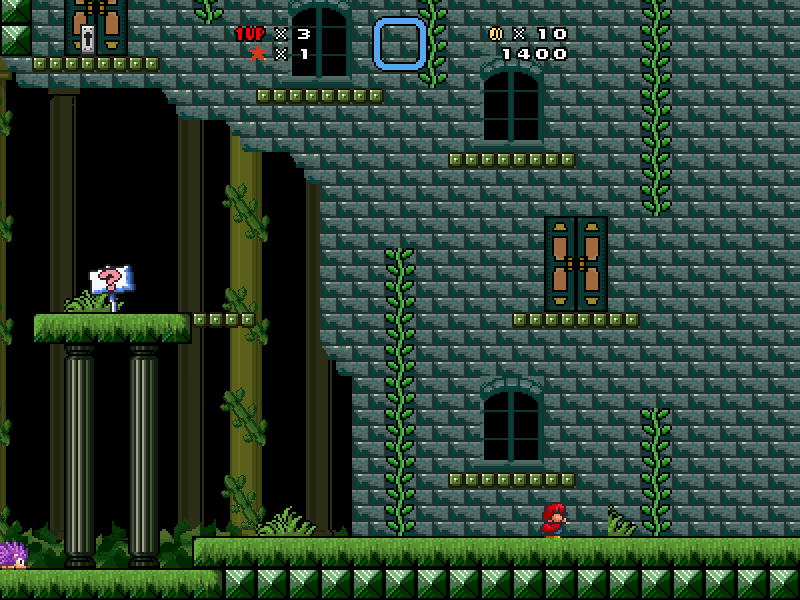 This is my favorite part of the level, especially since that's clearly a background image. My only complaint is that you forgot to indicate that it's a sign of truth, and maybe you should move it a unit or two to the right so that the player can read it without killing himself/herself. 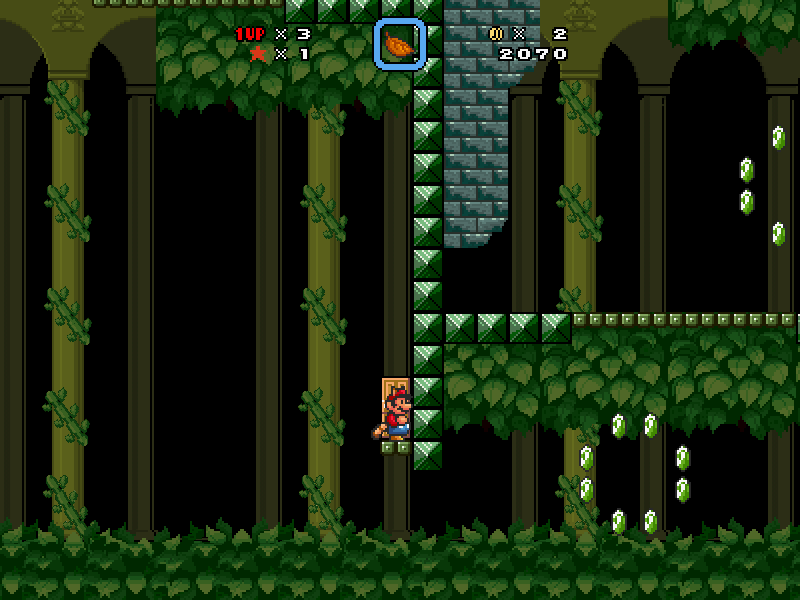 In fact, you didn't provide any way for the player to make it back to the main level if he/she fell down here, which you really should have since you put rupees down here which may lead the player to think that there's something important down there. You forgot to set framestlye=1 for npc-45. Two things: 1) This truth sign isn't necessary because you already have two lie signs that say to pick the other two switches. 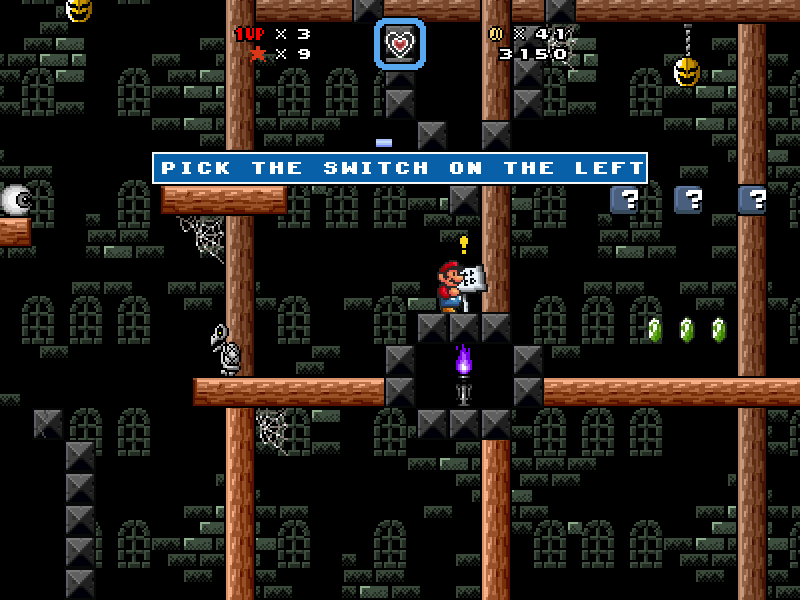 2) Don't use normal coin blocks as the switches, especially for something like this. 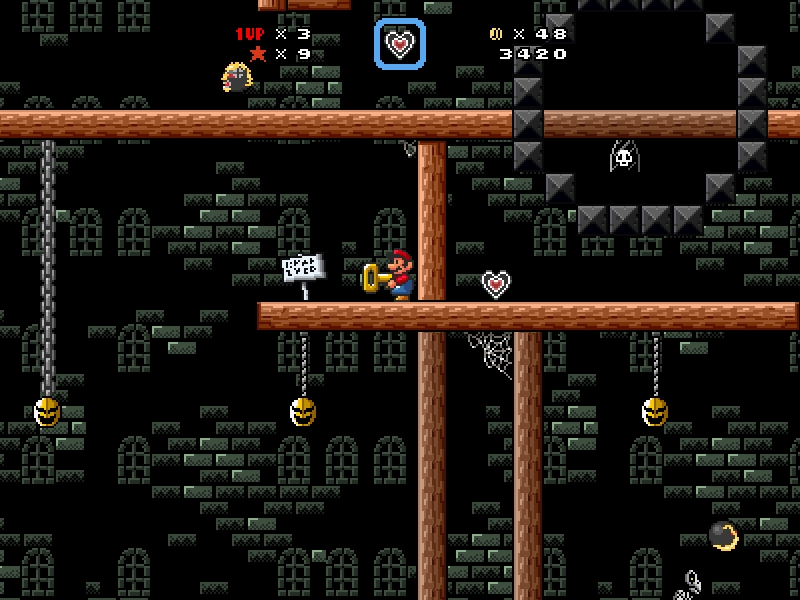 I thought that they were just normal coin blocks (I didn't realize that I was at the end of the section) and ended up hitting the wrong one and dying. I recommend replacing them with skull switches (npc-239) or at least putting a bit more emphasis on the fact that those are the switches that the signs are referring to. Maybe have them in a section by themselves or have the truth sign say "Those are the switches" instead. Your rhyming here is just lazy. In fact, if I remember correctly, using the same word twice doesn't even count as rhyming. 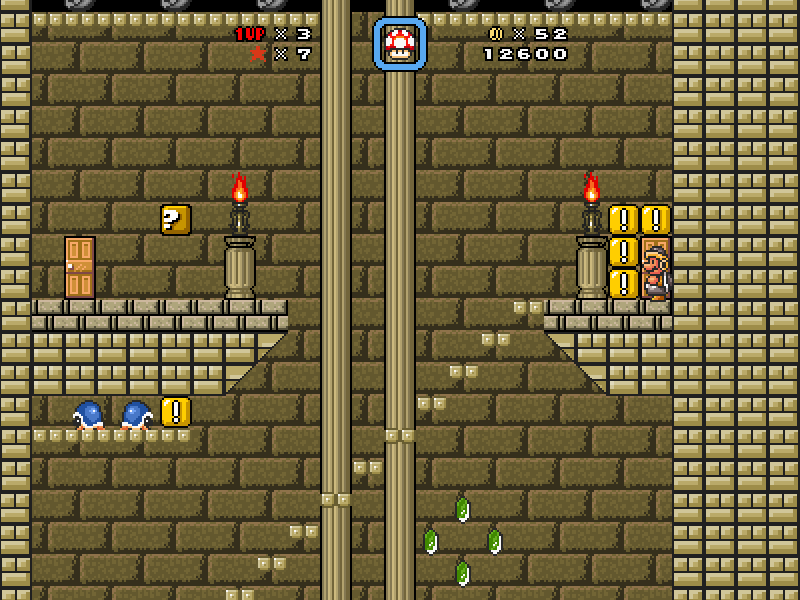 This firebar sprite swap moves too fast for first-time players to be able to react to it, so if they fall onto where it will move, they will take an unfair hit. I recommend moving it three units to the right. Also, just like the earth palace before it, there's no hint as to which path is correct and which paths lead to death. You should at least add some sort of hint or riddle so it isn't just a guessing game. 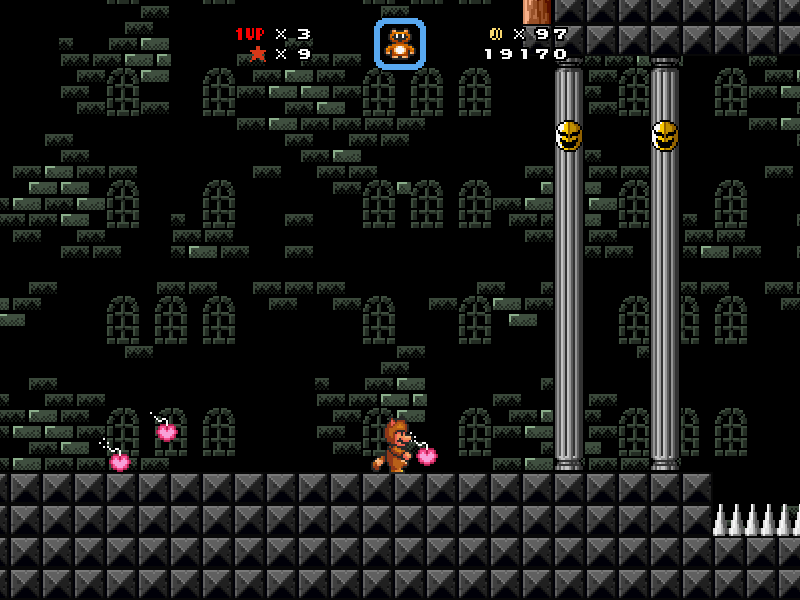 For this part, you should add some kind of indication as to which spike pillars will move and which won't, as this will cause first time players to take a hit (I had to get the Tanooki Suit from my drop box). 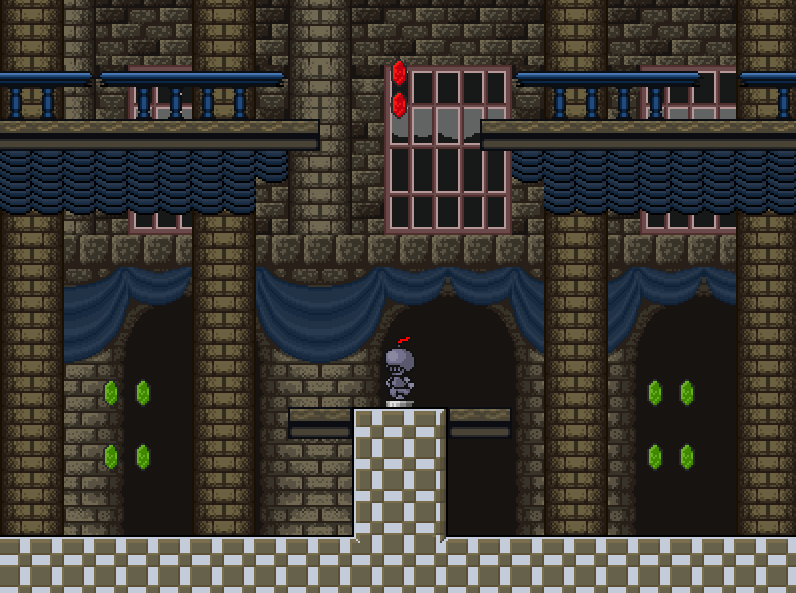 Plus, you forgot to sprite-swap the midpoint with the blue mushroom (unless that was intentional because ooohhh, it's the scary shadow temple; nothing is what it seems to be!). 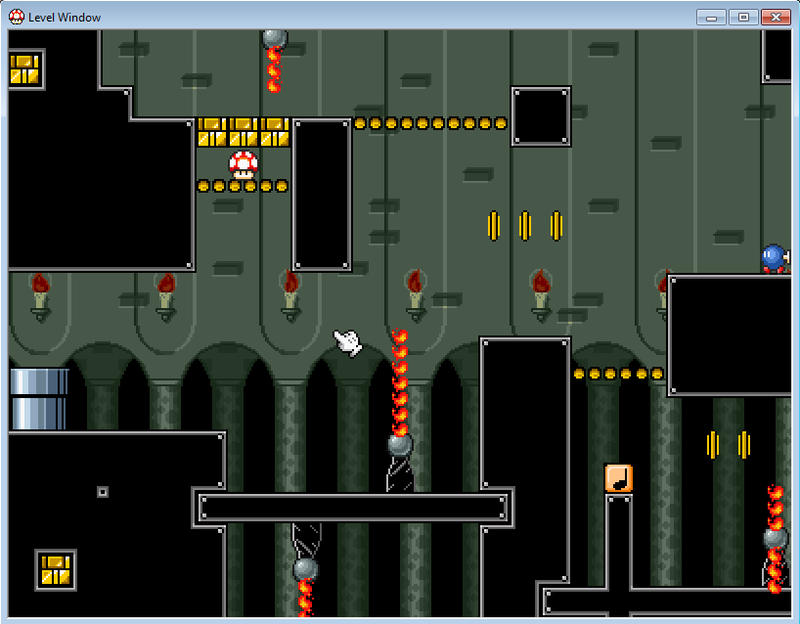 Also, you shouldn't just have invisible blocks in levels without some kind of indication. I went to jump over the spike pillar on the right and ended up hitting the block and taking a hit on the spike afterward (you can't see me because I took the screenshot when my character was flashing). Remove that invisible block. 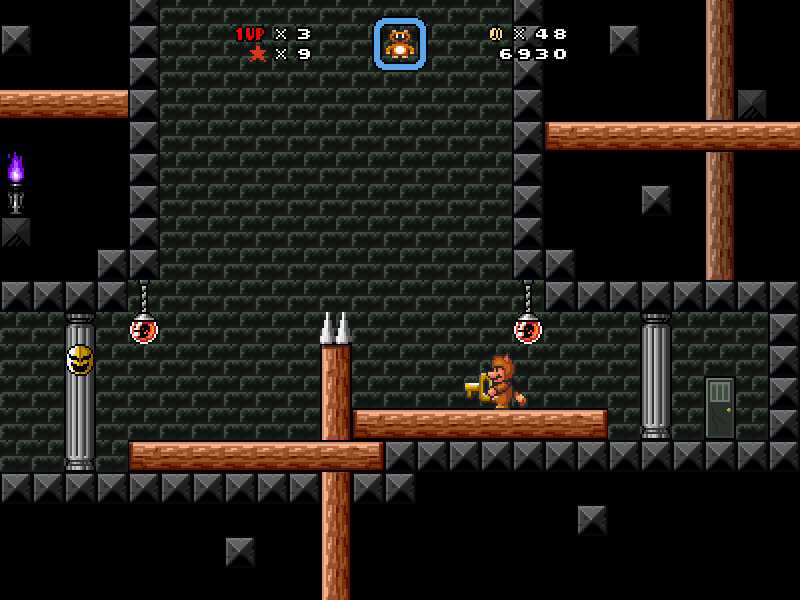 This part of the level is what really bugged me the most. You have a door here, but it doesn't lead anywhere. Once again, I look in the editor, and there's no warp attached to it, making this the third temple of yours where there's something that looks like it should have a warp with it, but doesn't. 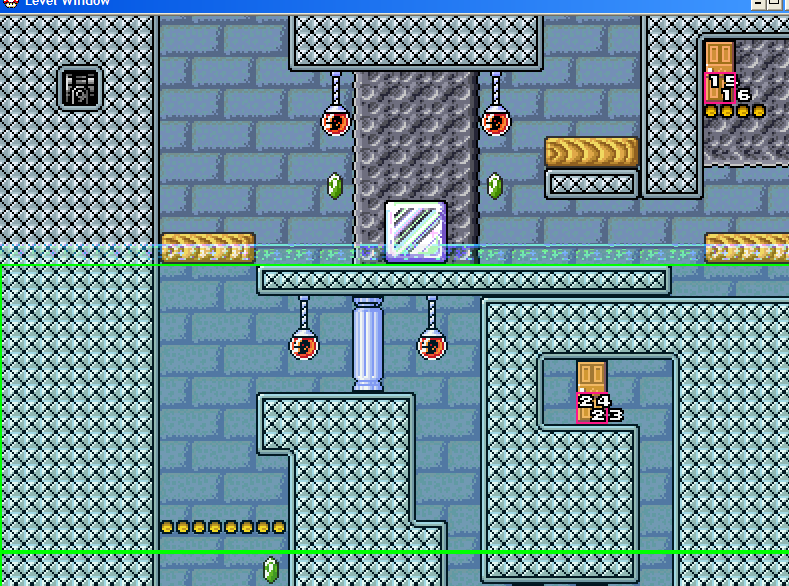 After scanning the different sections, looking for where this door might lead, I happened across where the midpoint was and realized that the door was just a trick; the player is supposed to use the key to jump over the ceiling. 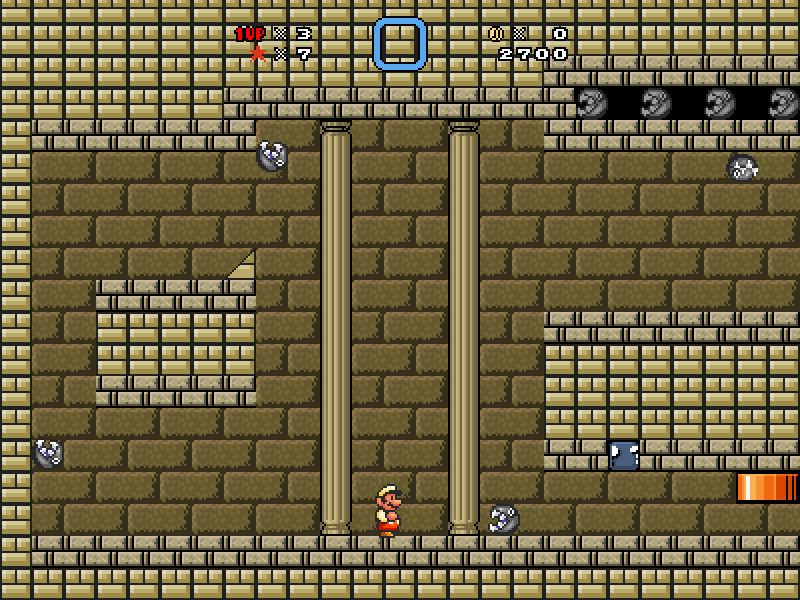 Not only is that unintuitive in and of itself (despite the fact that this is the shadow temple and is supposed to play with the player's expectations), but because of your two previous screw-ups (the door in the forest temple and the pipe in the sky temple), I had every reason to believe that you just forgot another warp, and so will everyone else. However, everyone else probably won't be as persistent as I was and may either give up or complain about how it's impossible. Remove the door, then add a sign that says something like "The key is necessary, but not in the way you may think." ...because you have a key generator in this section. I recommend replacing the generator with a single key. 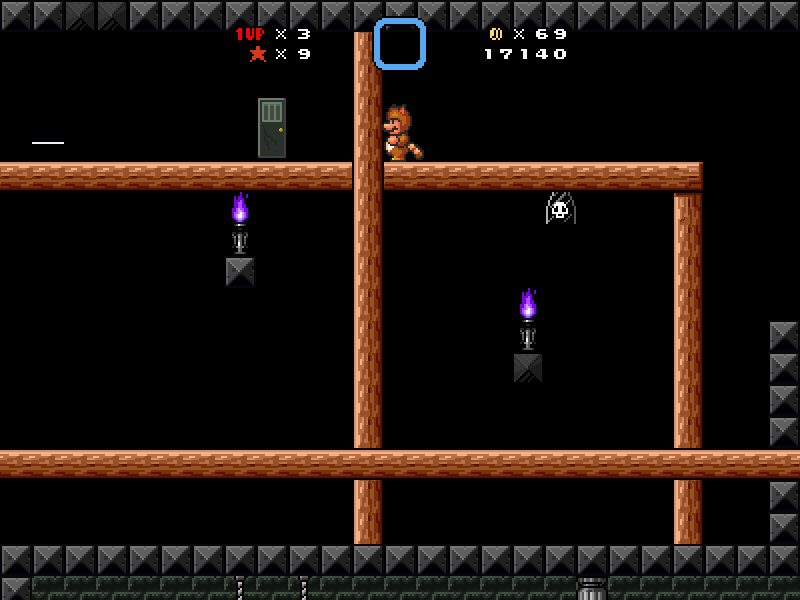 Also, the secret star for this level is unintuitive as well. This section is wrap-around, but by having walls nearly everywhere off-screen, the player will most likely not think to check everywhere for a spot where there is no wall. I recommend either removing all of the walls completely (the player can still be blocked by floors and ceilings) or moving the walls on-screen, then using the background wood for the spot that leads to the door that leads to the secret star. The shadow temple's boss is the most disappointingly easy boss in the entire level pack; the only thing special about it is the fact that it's the closest that the level pack gets to the title character making an appearance. 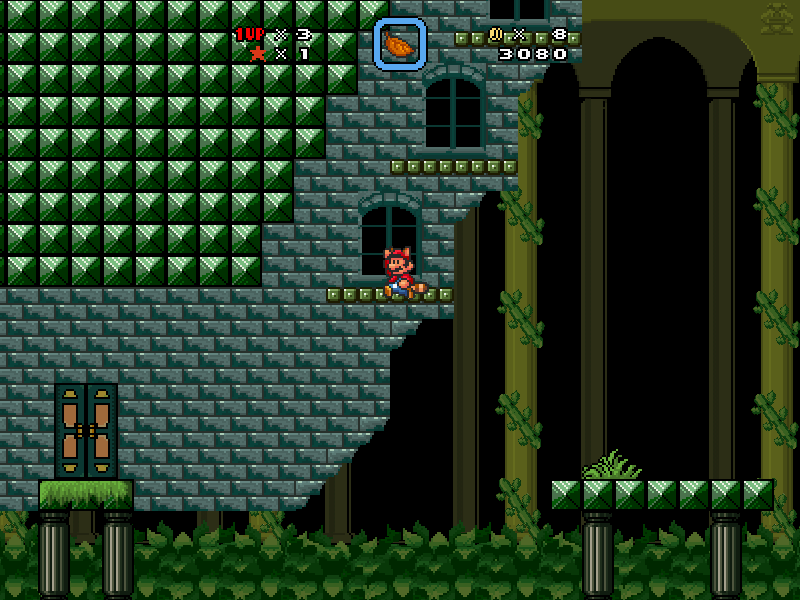 It's even easier than the grass temple's boss; at least with the grass temple, the Ludwig sprite swap is relatively difficult to jump over, meaning the player would either need to time bounces off of it or time being able to grab the consistently vanishing vine. In contrast, the shadow temple's boss is literally just three Mouser sprite swaps that the player has to fight in a row, and the Rinka sprite swaps don't make the boss any more challenging. 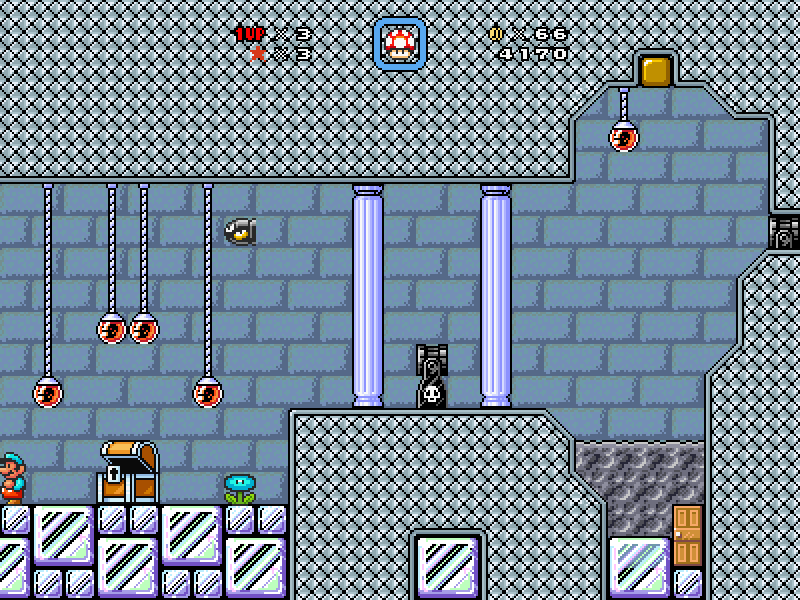 Also, you didn't properly resize the bombs, making it look like the player is holding onto air. 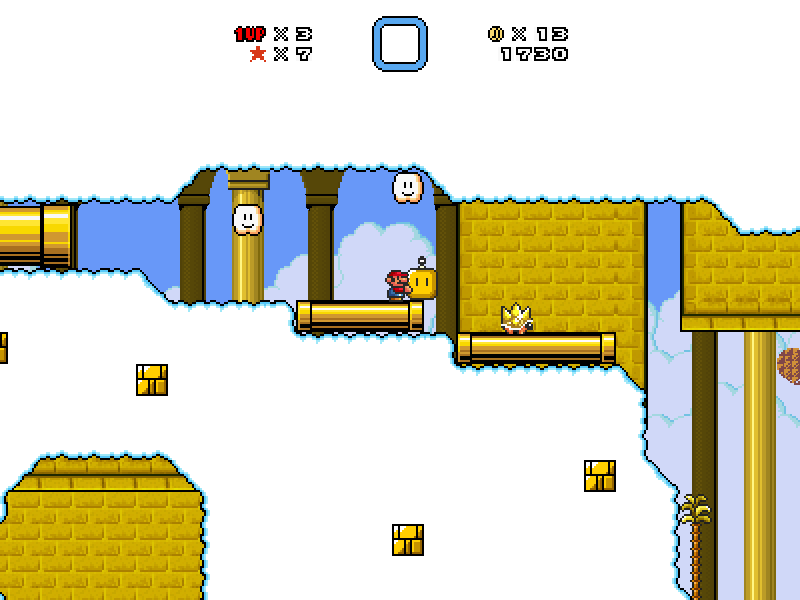 Although you have a few neat ideas and some clever puzzles, the levels are ultimately brought down by all of the numerous design flaws/oversights. Hopefully, you won't make these same mistakes with the time temple. 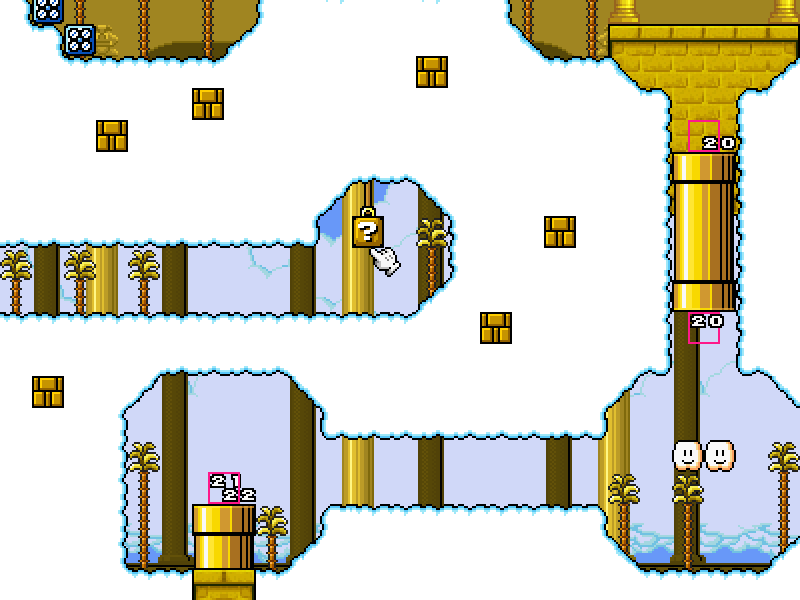 If you do fix the levels' problems and keep the time temple from having any new ones, this would be a neat little hidden gem on the forums. Also, I went ahead and moved this to Projects since, as you wrote, it's incomplete. As a side note, I didnt name my songs because it makes it easier to remember which songs go where, and its easier to type grass.mp3 10 times than ocarinaoftimeforesttemple.mp3 10 times, or even ootforesttemple.mp3. But I suppose I could make a .txt file with the real names of the songs in them. Yogi_Bear wrote: As a side note, I didnt name my songs because it makes it easier to remember which songs go where, and its easier to type grass.mp3 10 times than ocarinaoftimeforesttemple.mp3 10 times, or even ootforesttemple.mp3. I find it easier to just highlight the song's name, then copy and paste it into each section that uses the song. That way, you can cite the song without having to remember (or type) a long title. So...where are the songs from? Most songs are either from Ocarina of Time, or Paper Mario. The earth temples BGM is from Windwaker. I already made a .txt file (It will be in the 1.2 patch, which hopefully will be the last before the final) for them all so I dont think theres a need for me to go back and change all the music names in-game. Though I guess I could have just copy/pasted, so theres always that for next time. 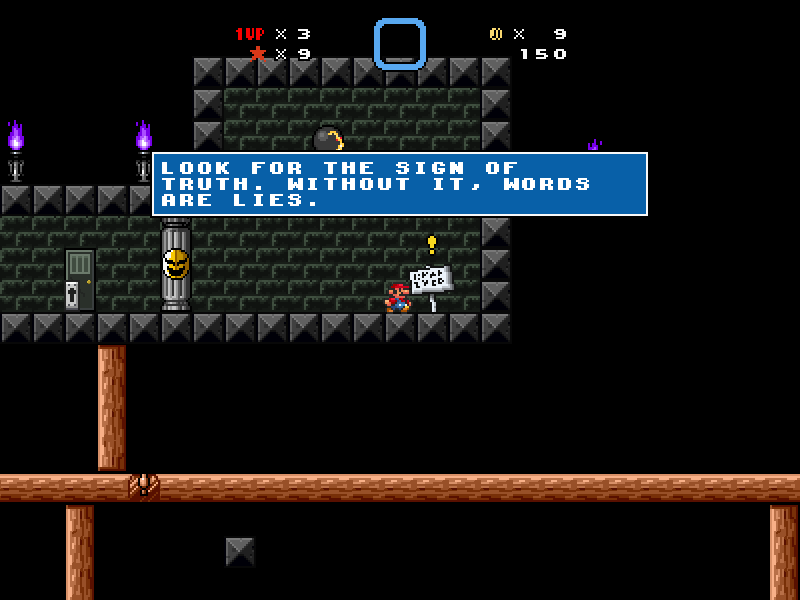 Also the Sign of Truth is used throughout the level, but I made a few edits to make it a bit more prominent. Yogi_Bear wrote: Also the Sign of Truth is used throughout the level, but I made a few edits to make it a bit more prominent. Well, my main complaint with that is that there are no other lie-signs in the level outside of that one section, making it seem gimmicky. You would need to add a fair share of lie-signs throughout the level (and to make sure that their placements are meaningful) in order to maintain a consistent theme. By the way, didn't you mention something like "The sign that says 'remember the lies of the past' hints toward which block you have to destroy in the section with the Tanooki Suit"? If so, I'd just like to go ahead and say that I thought that the sign hinted toward which path the player has to go in the Lost Woods-esque sections, as the correct order is the same as which switch the signs tell the player to push chronologically (middle, right, then left). 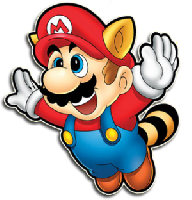 You may leave that hint where it is (or move it near the midpoint, if you want), but the section where the player first gets the Tanooki Suits needs a hint of its own. Also, you forgot to sprite-swap the eye's effect; it still appears as a Snifit. Actually I canned the whole lost woods thing. It seems unnecessary. 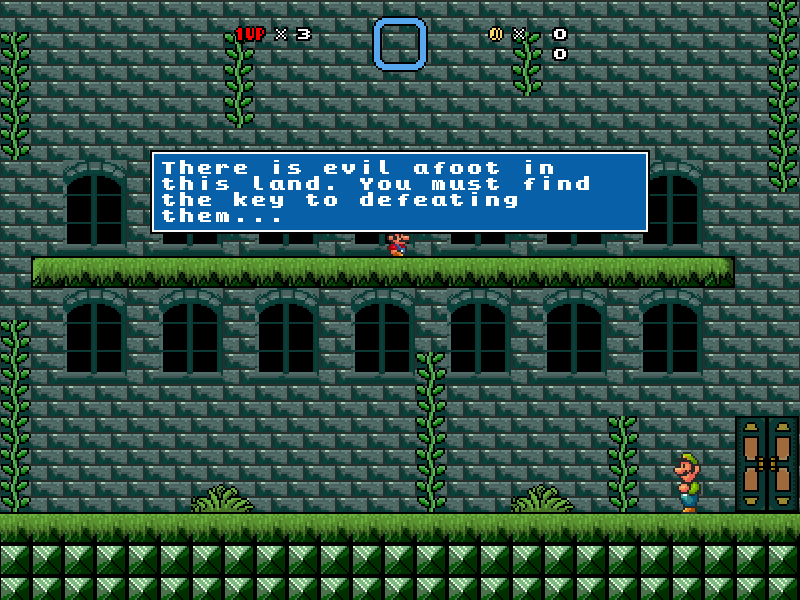 And besides the crummy boss, that sniffit effect is the only thing left to fix in the shadow temple. 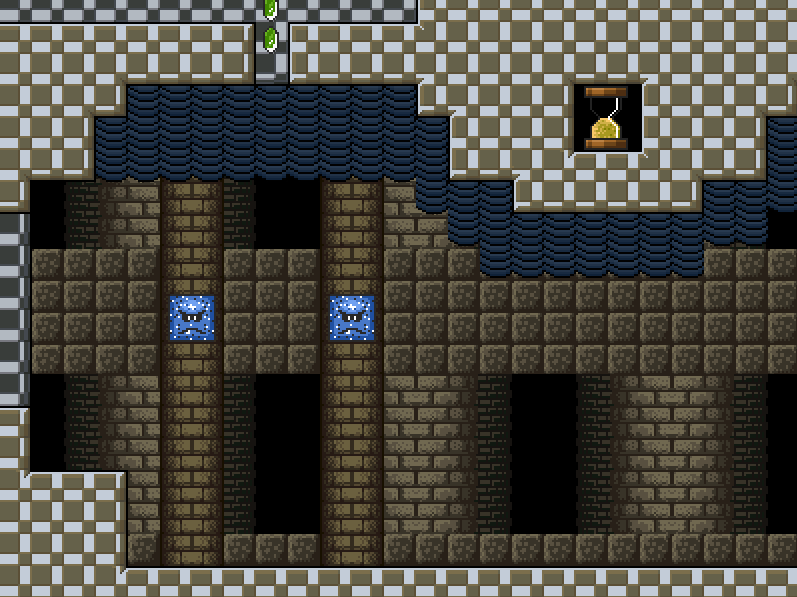 Then I *just* have to re-do the whole water temple fix the water temple's issues, and I will have fixed (hopefully) the 6 temples currently in the pack. 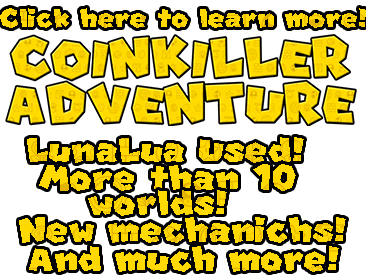 Also, I think I've fixed all of the previously mentioned flaws, so please be sure to point out all the new ones I made. I test in pieces, so sometimes I miss normally obvious stuff. Bump for some feedback! I've hit some creative block with the Temple of Time, but I could still use some feedback on the hub I made. EDIT: Temple of Time is done, but still no feedback on my terrible hub! So, I've decided to just re-do the hub. 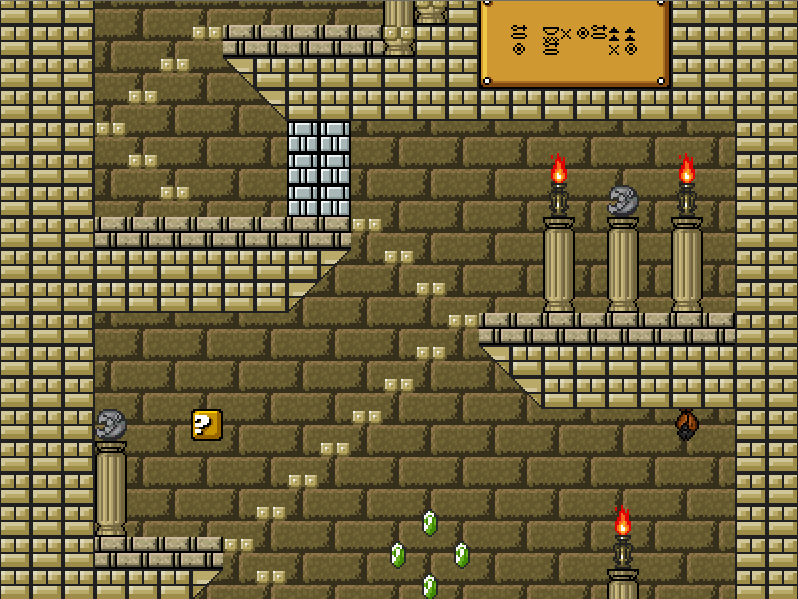 Its going to be pretty much like SM64, just navigate Peach's castle and use some kind of warp to get to each temple. It should be done pretty soon, and will be released with the Temple of Time, and some sort of ending to my makeshift story. Temple of Time is complete, new hub is made. Multiple changes to some temples, most are cosmetic, but I revamped a few parts to some of them. 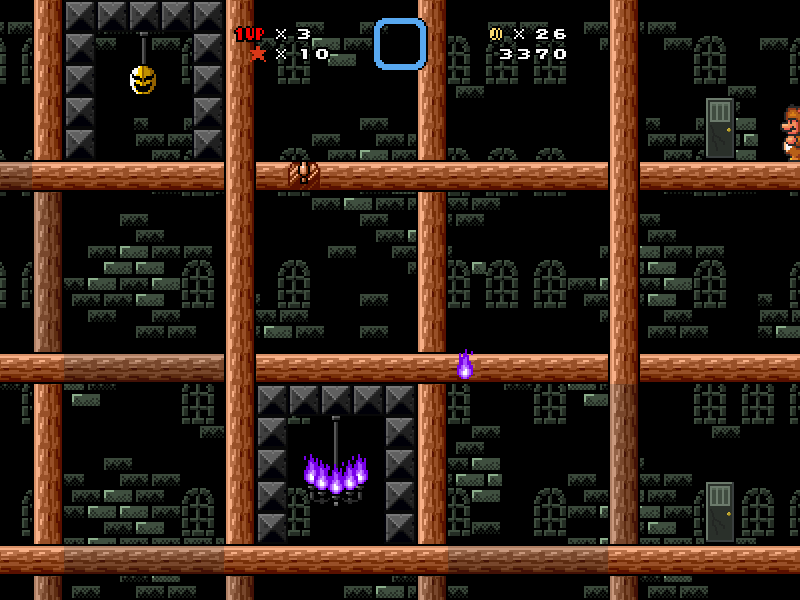 Most notably the Shadow Temple. Enjoy! Just giving this a little (ok maybe a huge) bump. My computer crashed so I dont have SMBX anymore, so I was wondering if it was worth it to finish this episode or leave it as it? This is finished now, so it can be moved to Episodes. Thank you!